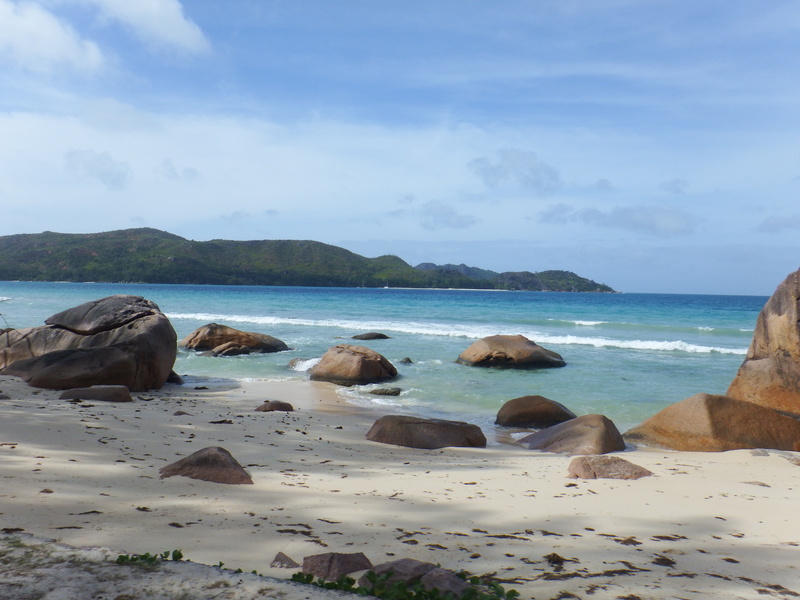 Before I continue on our journey I want to take it back to Seychelles and tell you about the island of Praslin, 28 miles northeast of Mahe. 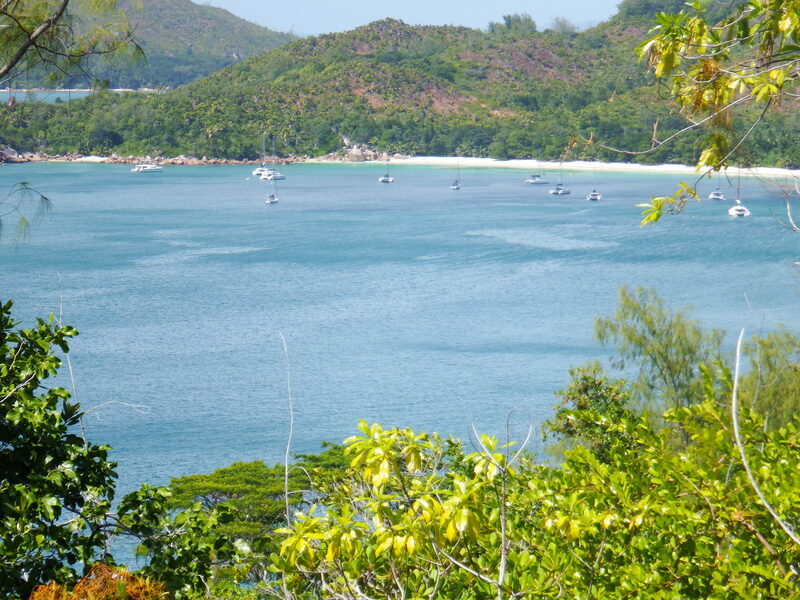 Praslin is Seychelles second-largest granitic island in both size and population. The highest point is 367m, the roads are quieter and the pace of life slower. 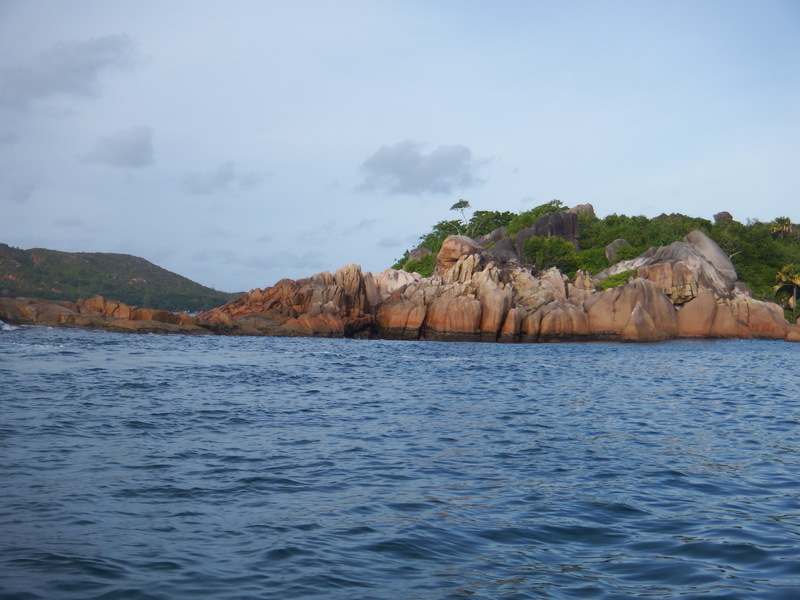 We finally left Victoria harbour on 20th July for a short stay off the island group in the St Anne’s national park. 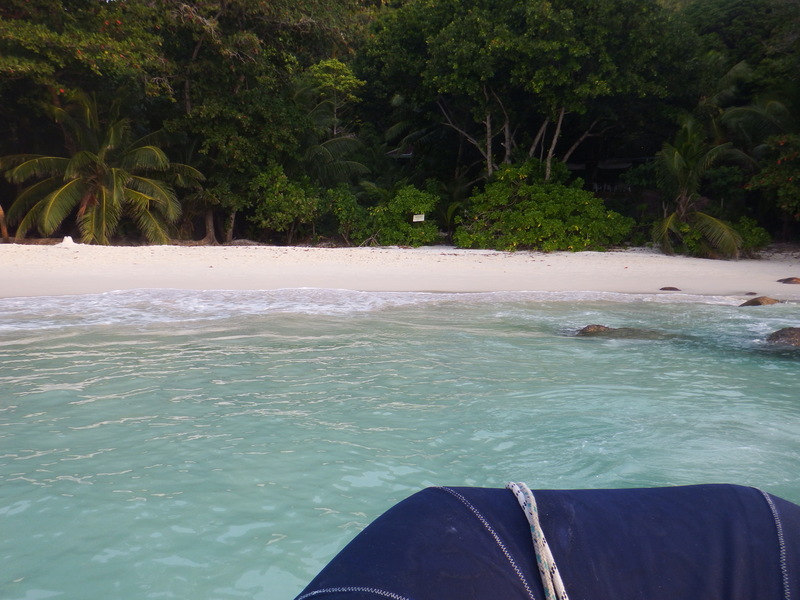 The stop was mainly to clean the bottom of the boat that had got pretty slimy after sitting not moving for 5 weeks but also the islands were very pretty. To stay in the NP normally it’s 200 SR per person per night which is about GBP10 each (and you don’t get anything for that) but I managed to sweet talk the park ranger who comes out in a little dory, to let us have 2 nights for the price of 1 “because we aren’t on holiday like the rest of these charter yachts”, he fell for it! 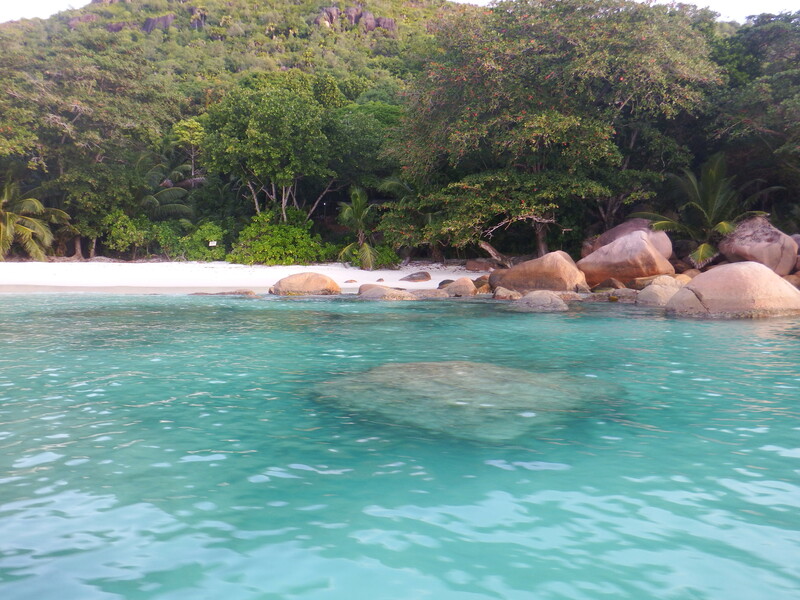 Friday 22nd we raised the anchor and had a wonderful sail over to Praslin, F3 on the beam, no swell, my kind of sailing, and dropped our anchor at Anse Lazio mid afternoon. As luck would have it our friends Davina and Antony on Divanty were in the bay and kindly invited us on for drinks in the evening as they were leaving the next day. The bay is stunning and has won many polls as the ‘Best Beach in the World’ we’ve seen some wonderful beaches and I have to say it’s pretty near the top. (Note my computer has died with all my best photos of the beach on it, I still had some on my camera although they aren’t my best ones they will have to do until my computer is mended). 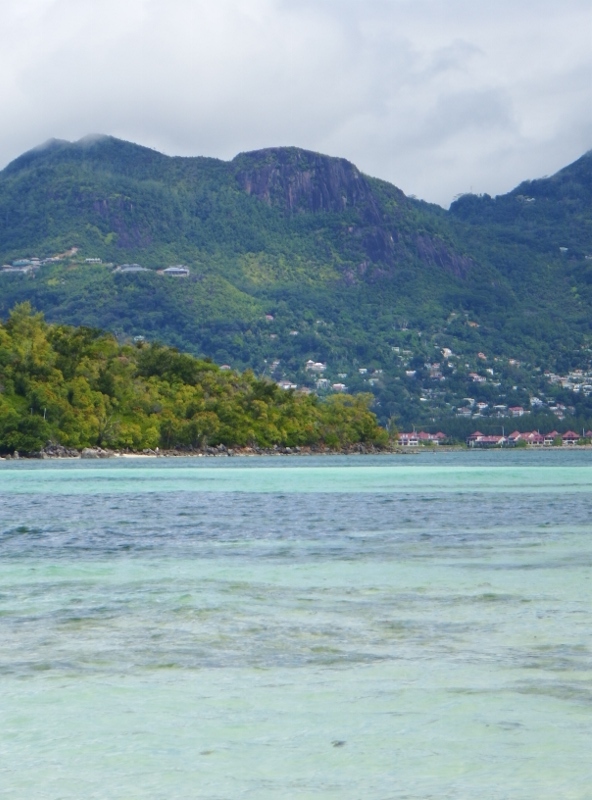 The granite islands of Seychelles are unique, they are the world’s only oceanic granite islands and they are also the world’s oldest ocean islands . They were formed three-quarters of a billion years ago and have never been submerged. As recently as 10,000 years ago they were still a single landmass during the last ice age when sea levels were lower. 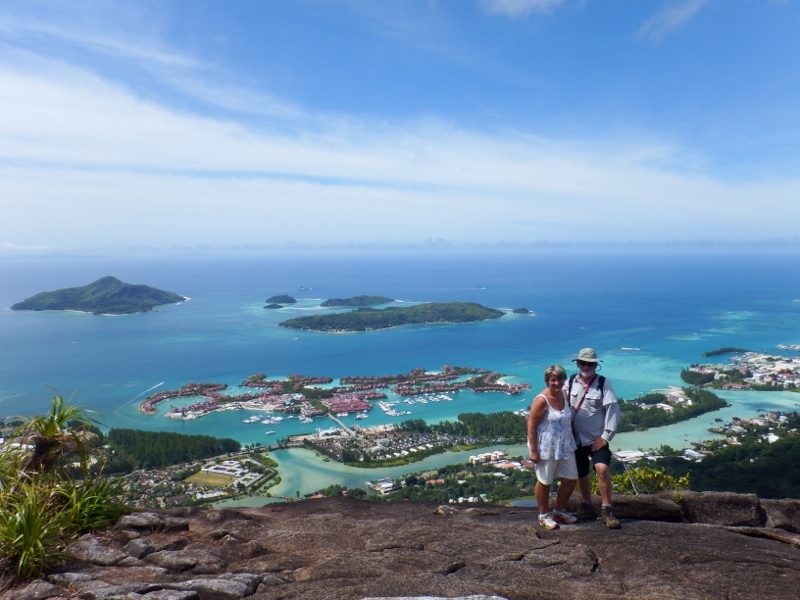 Today, we just see the tips of the mountains which forms the islands of the Seychelles. 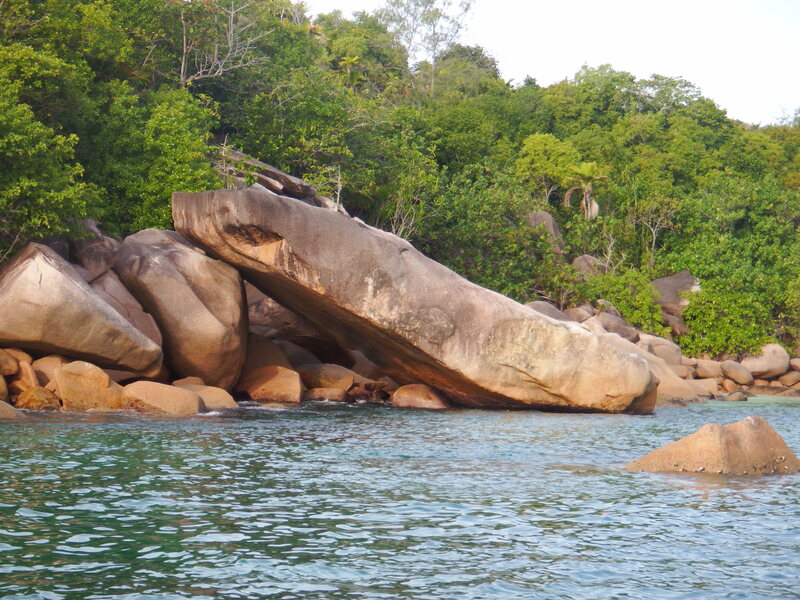 Pink granite boulders – guess why I like them! 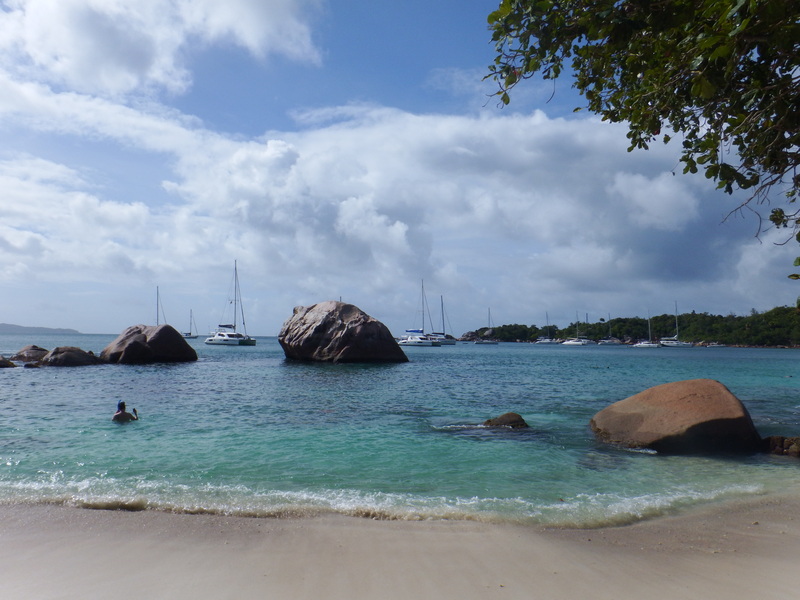 The centre of Lazio beach is pure white sand with a brilliant azure blue sea breaking onto it but around the edges are the huge pink granite boulders of all shapes and sizes the islands are known for. Absolutely stunning. 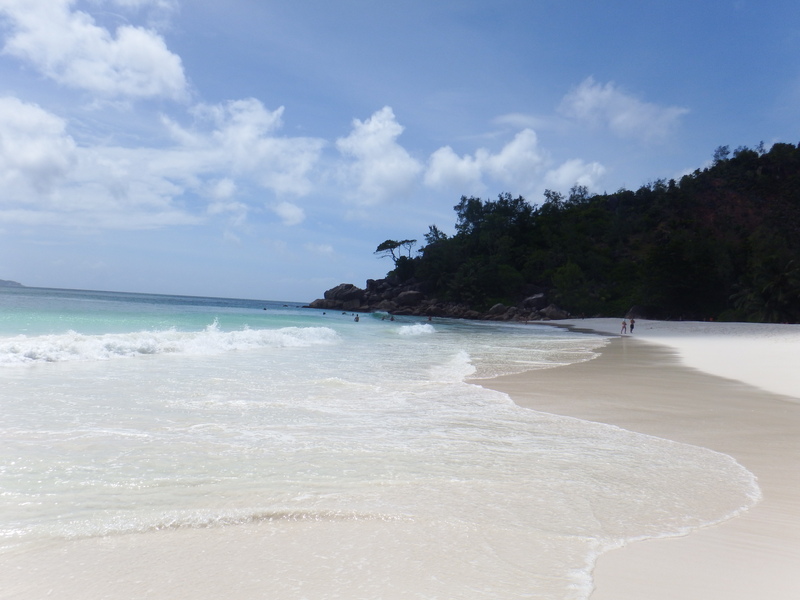 Photos don’t do it justice you need to go there and it would be perfect for a honeymoon……. 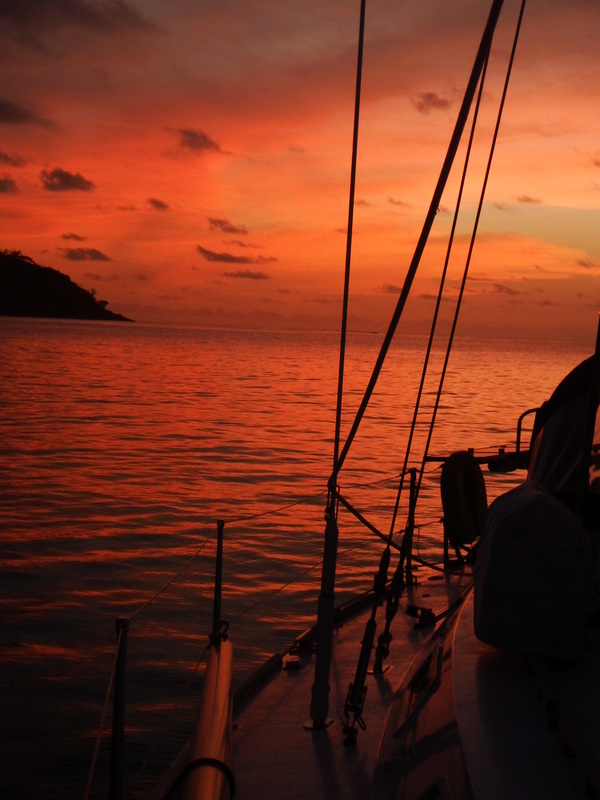 Our first night at anchor was quite refreshing, it was still hot because we are only 4 degrees from equator but with a light wind blowing over the anchorage it kept the boat a little cooler. 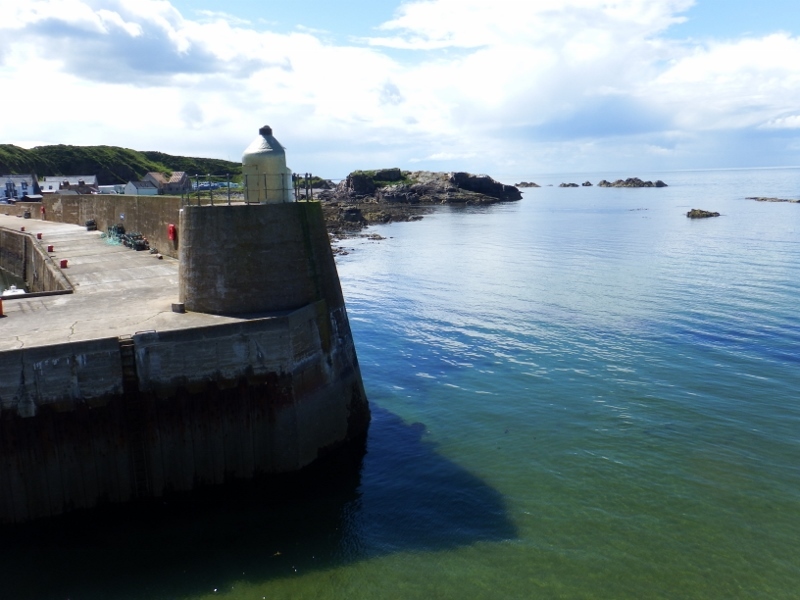 The anchorage is on the north west side of the island and the wind comes from the south east at the moment so it’s quite calm there although you have to be careful when landing the dinghy because there’s a bit of swell and it’s enough to give you a wet landing. 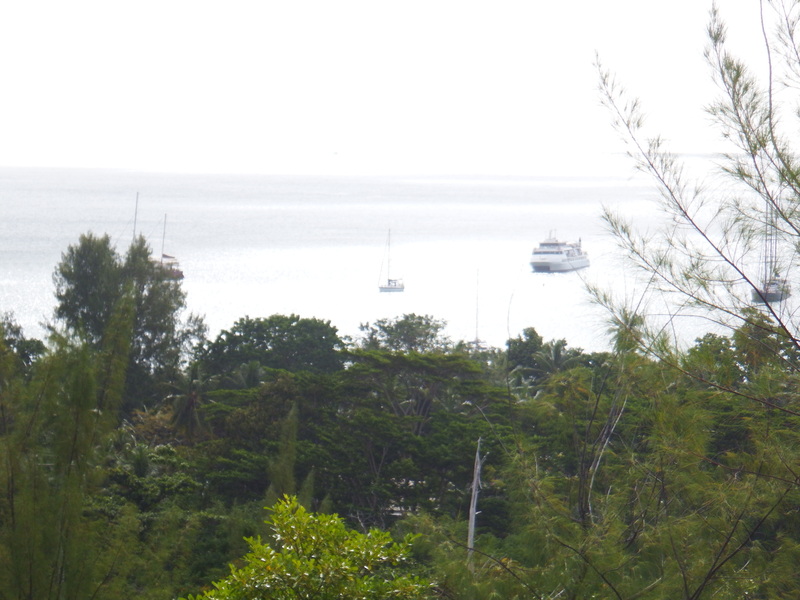 One of our sources of amusement is watching the charter yachts trying to land their dinghies! On the Sunday we decided to go exploring. 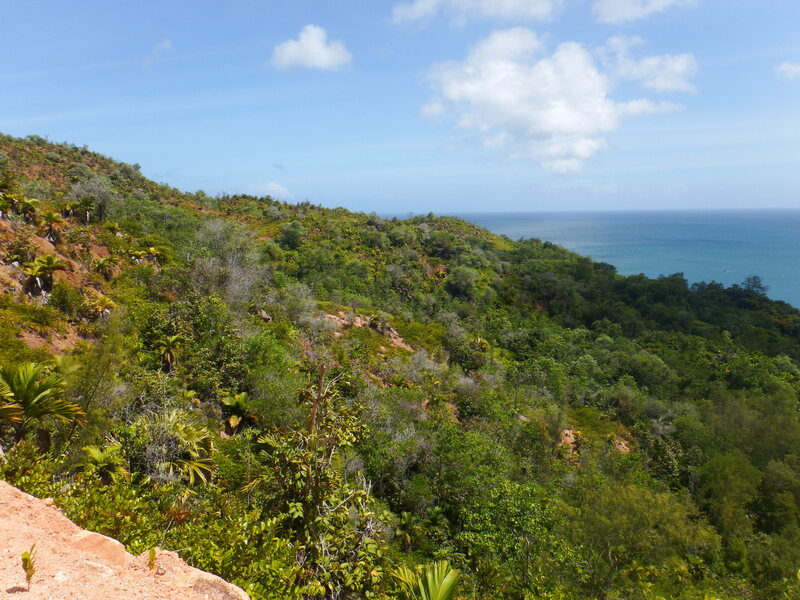 We had been told of a nice walk over the hills to the south side of the island, continue to walk to anse Georgette and back across the hills on the ridge walk to our anchorage. We needed some exercise so off we went. For future cruisers as you look at the beach the entrance to the track is at the end of the right hand side of the beach. There’s an arrow painted on the rock. 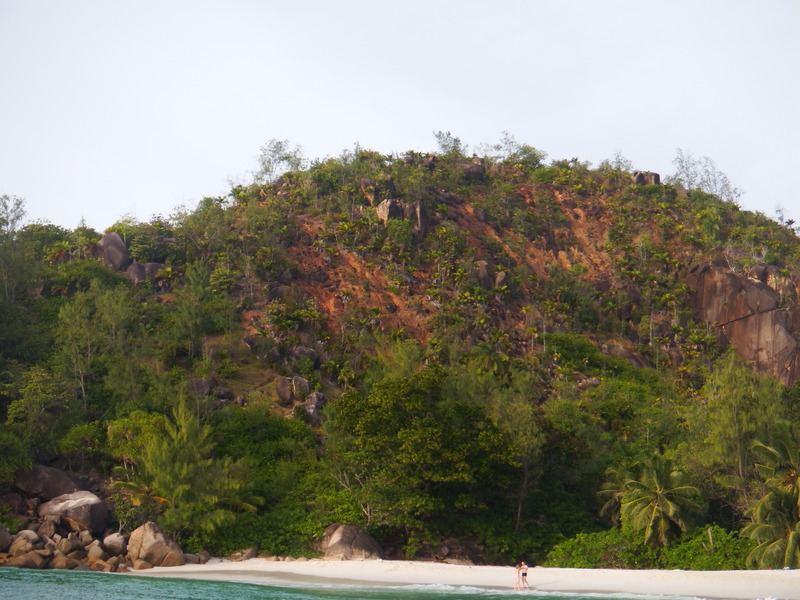 It started to rise quite steeply after about 10 minutes and became really hot out of the wind shadow of the island. 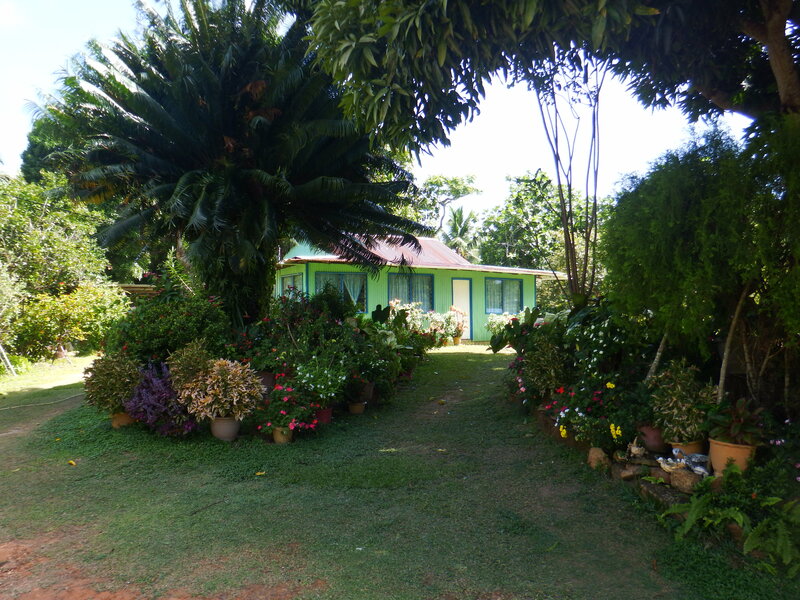 You pass one little house then you reach a plateau which had a really pretty house surrounded by beautiful gardens. This was the start of the road but only for 4x4s because it was still very rough. Allegedly this is where the path divides and leads to the ridge walk to Georgette but we couldn’t find it and decided to stay on the track we were on and come back on the ridge walk. 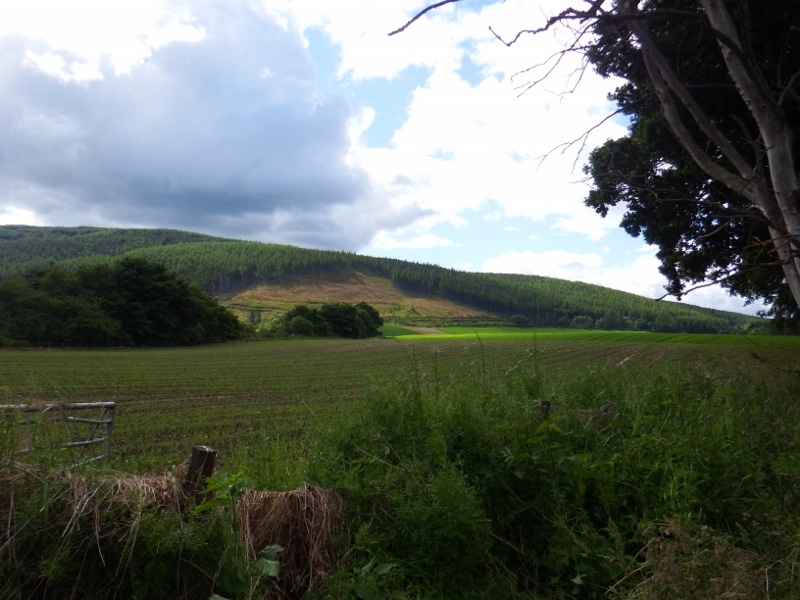 The scenery was amazing with many different types of trees on our journey. We continued up another hot steep section without any shelter from the sun. The earth was also very red which seemed to attract the heat. Finally we got to the top and looked back to the anchorage. The views were astounding. The walk on the other side was under trees allowing us to cool down a little. The road starts at the bottom of the gravel track and this is where you can catch the bus that’s takes you right round the island to the other end of Lazio beach and many points in between. Any ride is 5SR which is about 30p so if you get off after one stop or go to the other side it’s 5 SR. We were walking today so just watched as it passed. 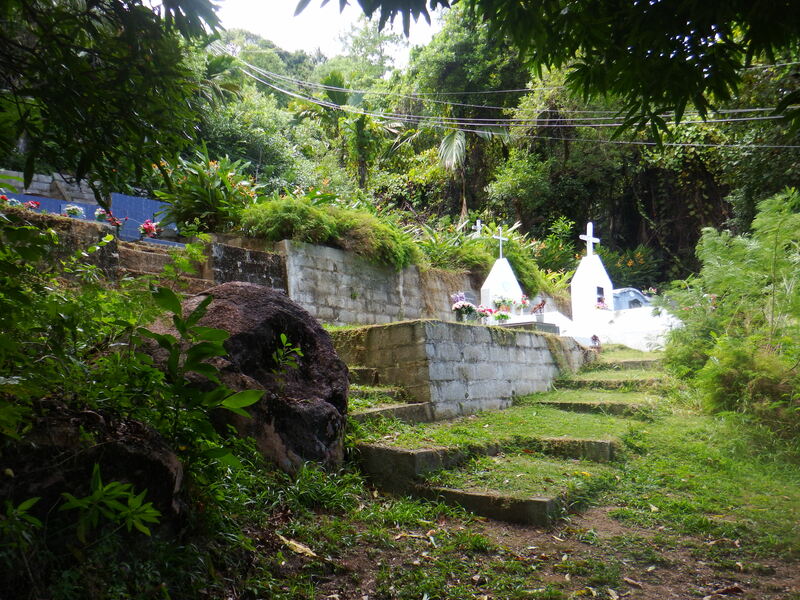 This dear little cemetery was half way down the hill …..
… and there were bananas growing in the trees every where. Once you reach the bottom of the hill turn right towards the big posh Lemuria resort. There’s a security guard on the gate but it he was allowing people through because it’s the only way to Georgette beach. 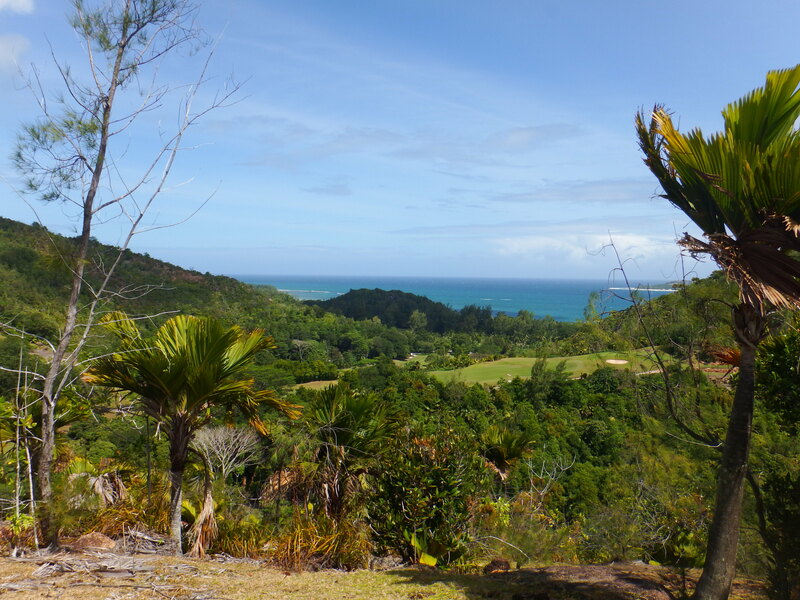 The resort has the only 18 hole golf course in the Seychelles and very nice grounds. 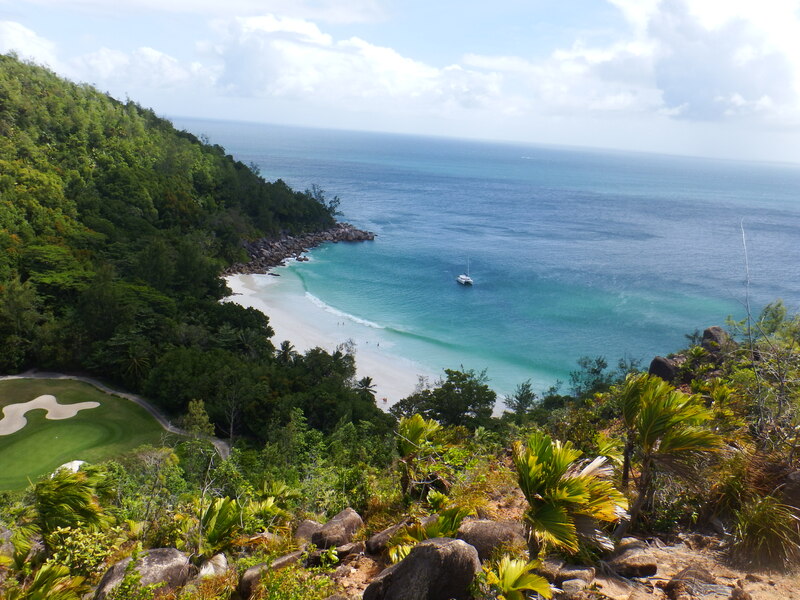 Stick to the path and after about 200 metres you’ll see a sign to anse Georgette on the right hand side. The path leads up past one of the fairways. Looking back down the fairway the path was along the other side of the lake. We’d been walking for an hour or so by now. Follow the signs alongside another fairway and then you come to the beach. Very similar to Lazio but a bit more surf. 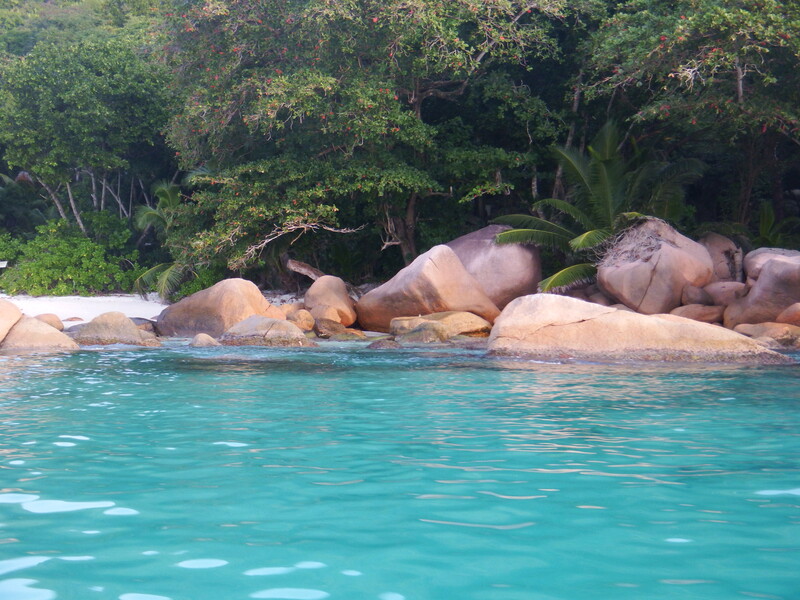 We sat and ate our picnic to the sounds of crystal clear water crashing against the majestic granite boulders then rising up the soft white powdery sand leaving little bubbles by our feet. It doesn’t get much better than that. Magical! 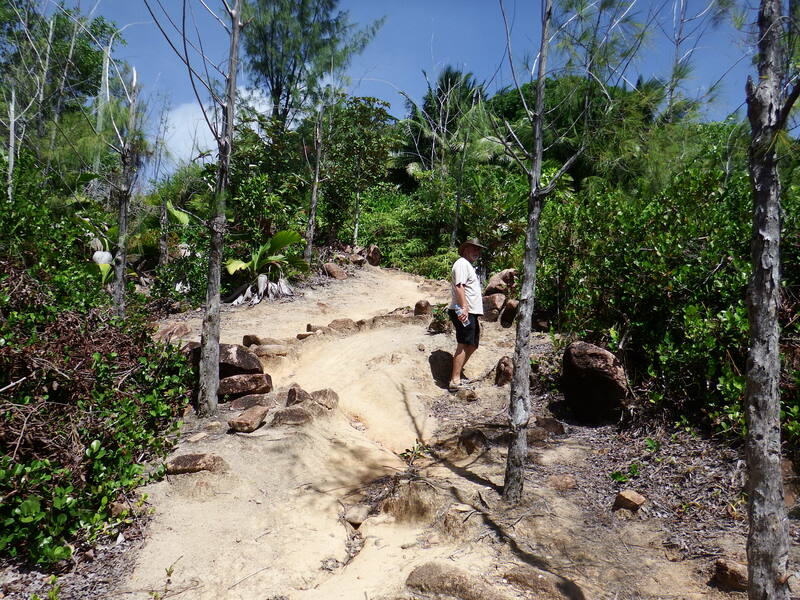 With your back to the sea walk to the left hand side of the beach and you’ll find a narrow path leading up. 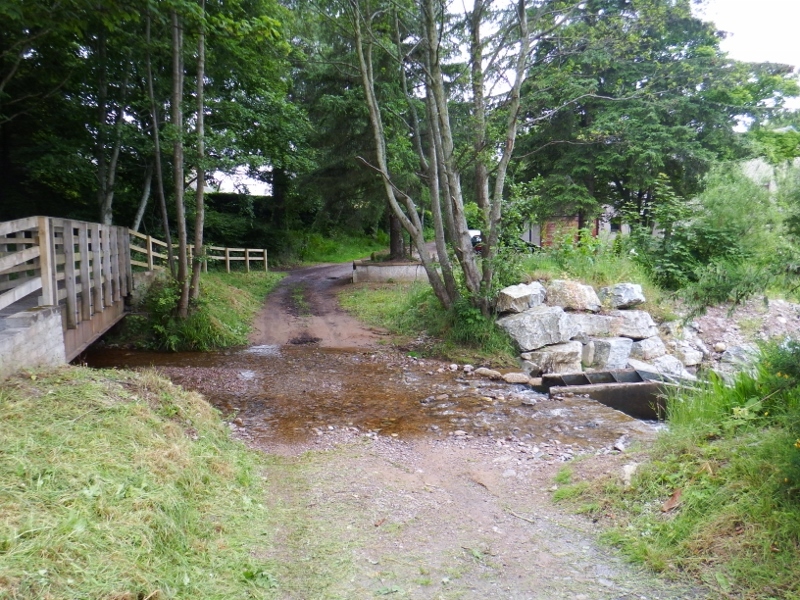 This is the entrance to the ridge walk. A little note here, this turned out to be a very difficult walk and only anyone with mountain goat qualities should attempt it – unfortunately we didn’t know this at the time! The views were amazing as we started to climb. From this height you could see the swell coming in and even the catamaran was bobbing around quite a bit. The golf course comes right to edge of the beach. 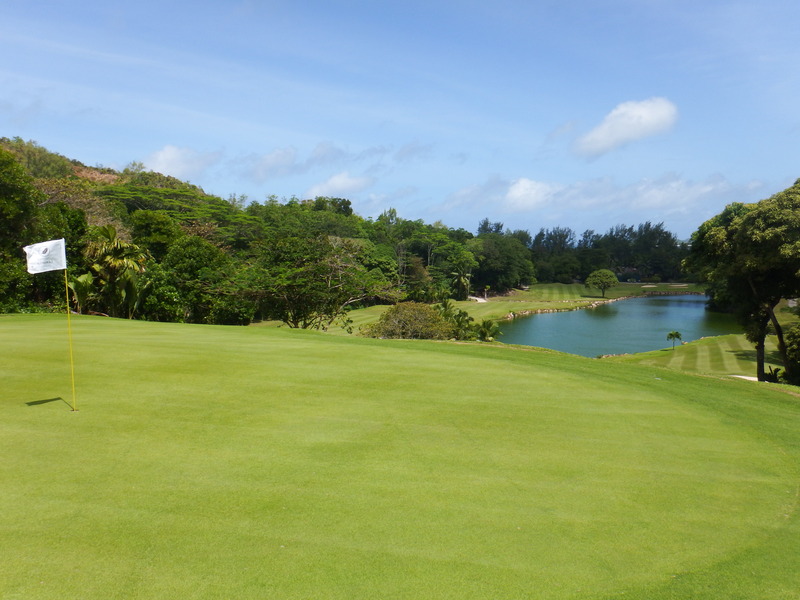 If you are a golfer this must be one of the most scenic golf courses in the world. Once on the ridge the views over both sides were stunning; looking over to the other direction we could see the sea on the south coast. Once clear of his settlement we stopped to look at the bite, it was only a little nip thankfully and I cleaned it and put a plaster on it. The path started going up again really steeply but we had no choice but to follow it and eventually it came out by the pretty house on the plateau but even when we knew where it was it really wasn’t obvious. We stumbled back down the hill onto the beach quite exhausted but both agreed it had been a difficult but good walk and had taken us about 4 hours in total. The anchorage was full of charter boats when we got back to the dinghy. There’s a circuit they all seem to do and Sunday is Lazio. Little tip for future cruisers. The next morning, gluttons for punishment, we walked back over the hill again but only as far as the bus stop. 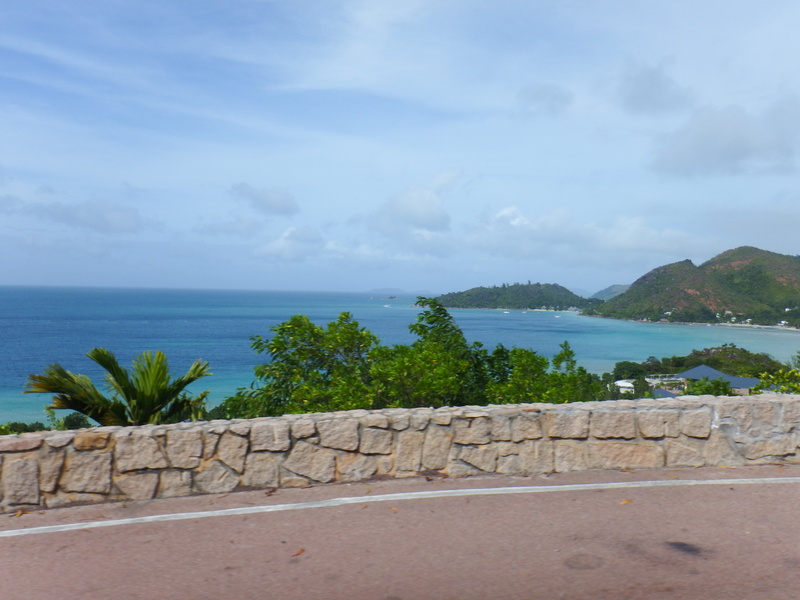 We took the bus to Grand Anse which is the largest settlement on Praslin. There are several hotels and restaurants, not to mention a very nice coffee shop, as well as a branch of the STC supermarket chain. 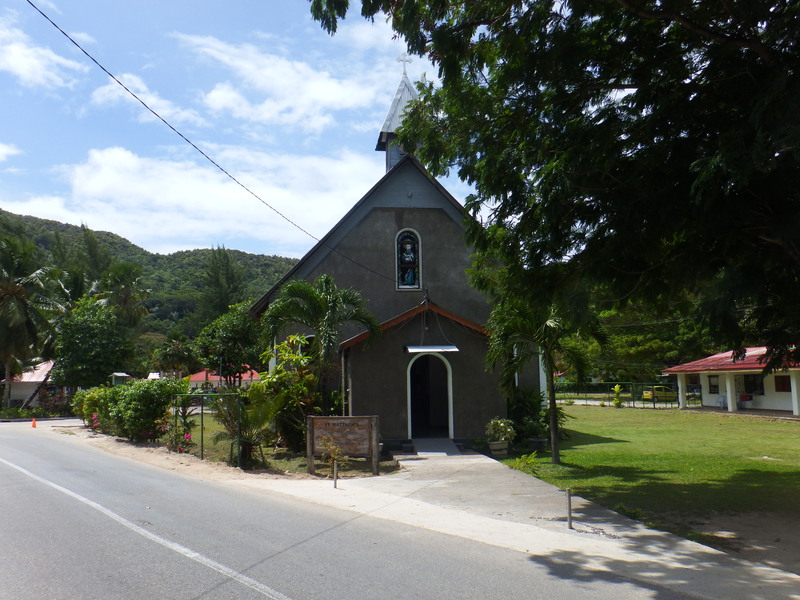 87% of the Seychelles is catholic and this little church was right in the middle of the village. We had a very nice lunch before getting back on the bus to do the bus ride around the island. This was not for the fainthearted! This little bit of wall was all that separated the old Leyland bus from going over the side on the narrow mountain roads, there wasn’t any thing at all in places. I wouldn’t mind but he was driving as though he had the devil in his tail. 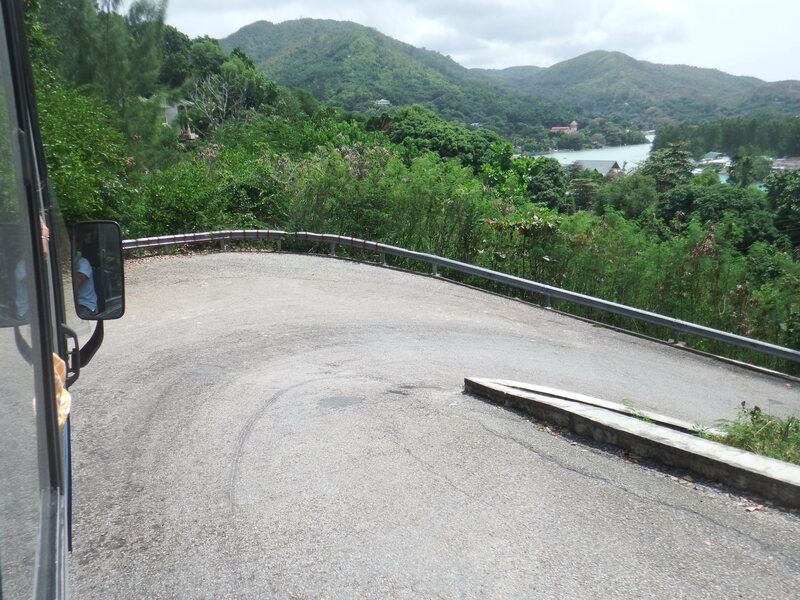 I’m sure he knew every bend and crevice in the road but it felt very scary. The views were amazing though. Difficult to take photos on the move but I managed a few. 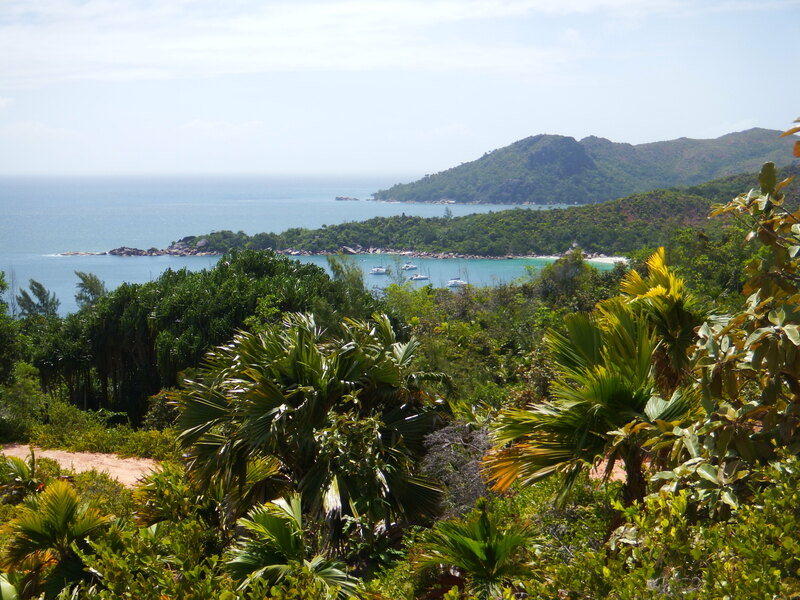 The bus continued to Anse Boudin where we got off to walk over the hill to the other end of Lazio beach. An easier walk in that it’s smooth road but still just as steep. If you have a car you can drive right to the beach but we walked. The view from the brow of the hill showed that all the charter cats had gone but there were a couple of bigger boats there instead. On Tuesday, having had 2 walks in 2 days, we decided to stay on the boat and do some jobs. Bill had bought a new aerial and cable in the UK for the VHF. This is the second aerial and cable in 2 years but tests had indicated that the reason the VHF wasn’t working was the aerial. The old aerial had been changed in Victoria and Bill discovered it had been leaking and had some corrosion on the inside, he hoped that had been the problem. 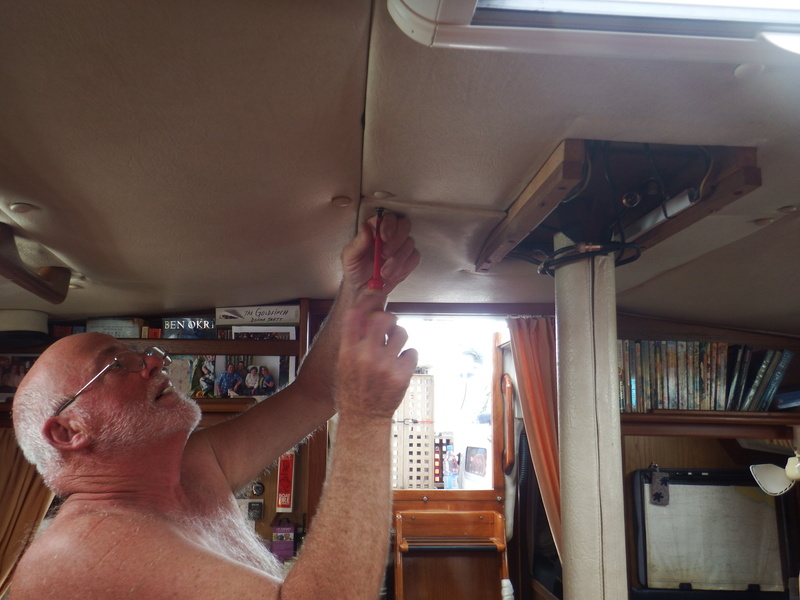 While performing a radio check with a couple of other boats they reported our radio was still crackly so Bill wanted to go ahead and change the cable too as the top foot or two had also suffered from corrosion. 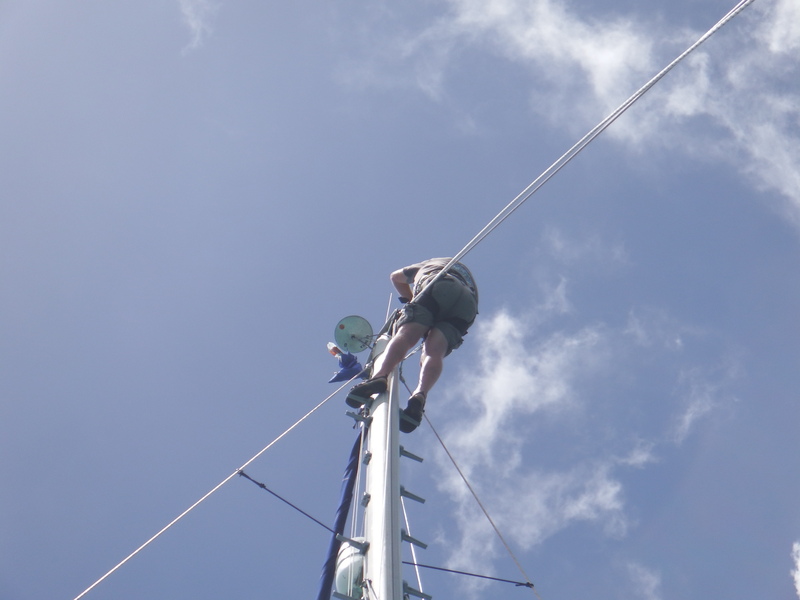 That entailed him sitting at the top of the mast, joining the new cable to the old and pushing it into the mast while I was at the bottom pulling it through. Sounds easy? Nothing is ever easy on a boat; after an hour an a half it eventually came though. Poor Bill’s legs had gone to sleep. 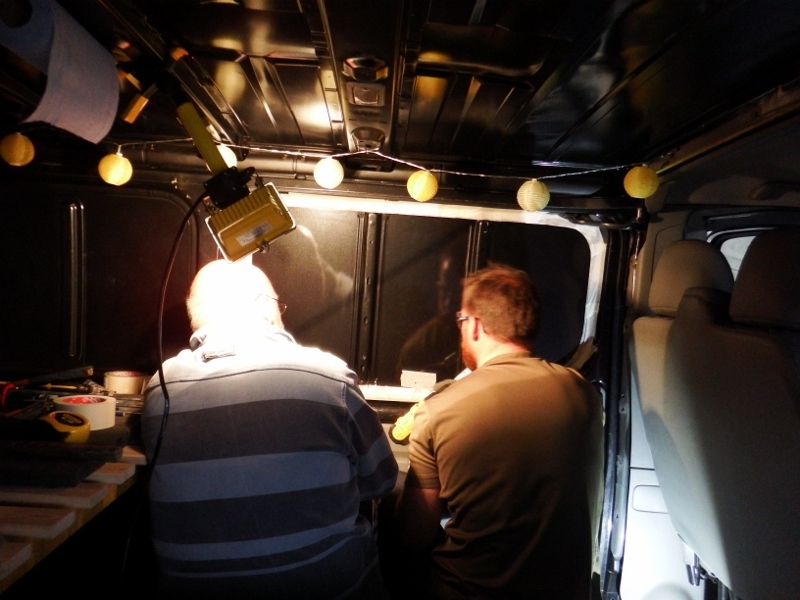 Now it just needed connecting to the back of the VHF – simples! 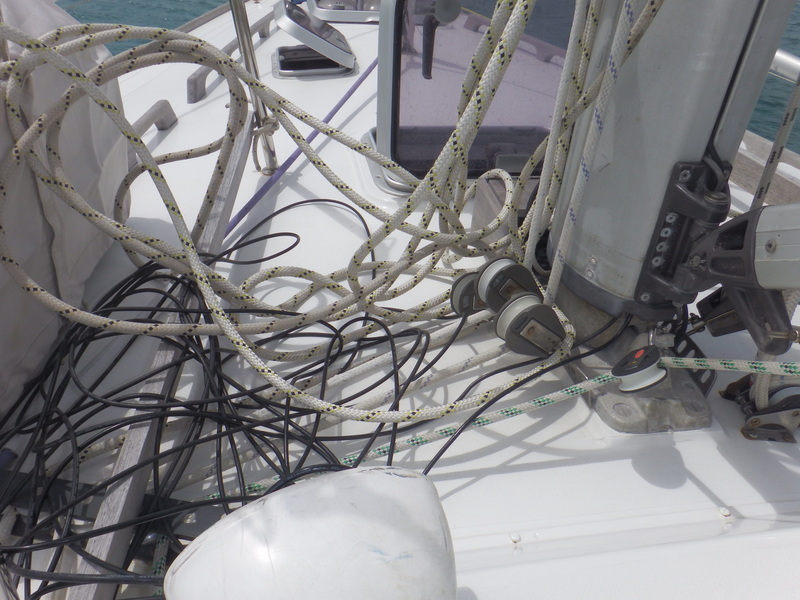 Bill spent the rest of the day running the cable to the back of the VHF – again nothing is easy. To do that he had to take the headlining down, before that dismantle the lights. My cupboard had to be emptied and the new cable pulled right through so it could be connected. Took the rest of the day. As many of you know Bill is very versatile. 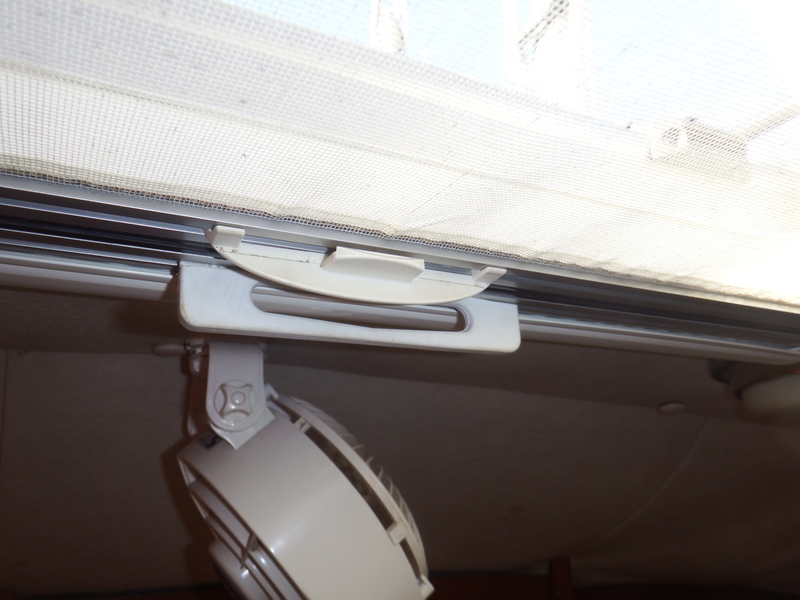 Some time ago I had broken one of the handles on our Oceanair hatch blind and we haven’t been able to get a replacement. So on Wednesday Bill was pondering about this then started borrowing into his ‘it’s all rubbish’ locker and out came an old chopping board. Half an hour later – a new handle. How clever is that! Later that day Tintin arrived but I don’t seem to have any photos of them and they were right next to us. On Thursday we did our third walk up the hill with Kevin and Jacqui and caught the bus for the island trip but this time we got off in St Anne’s bay. 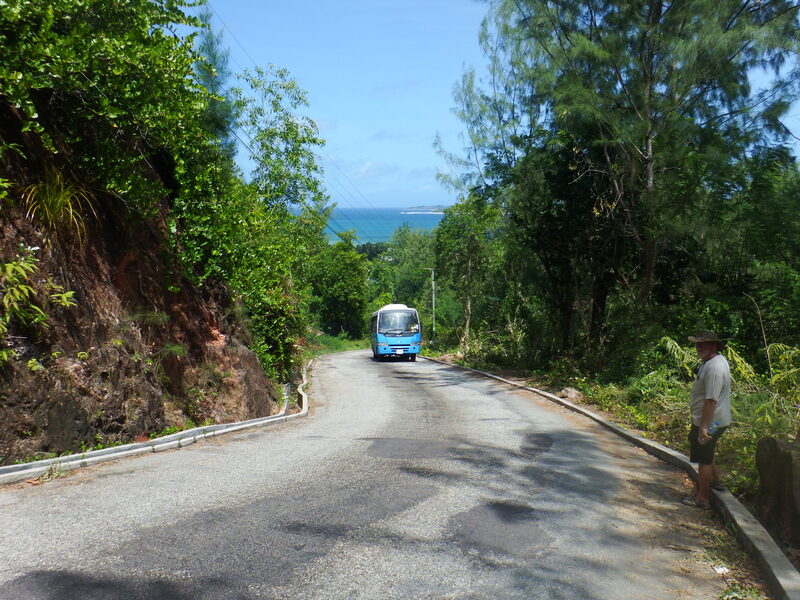 The last bit of the bus ride down into the bay is really scary with some really tight bends but the driver went just as fast as on the straight, we were all hanging on tight. 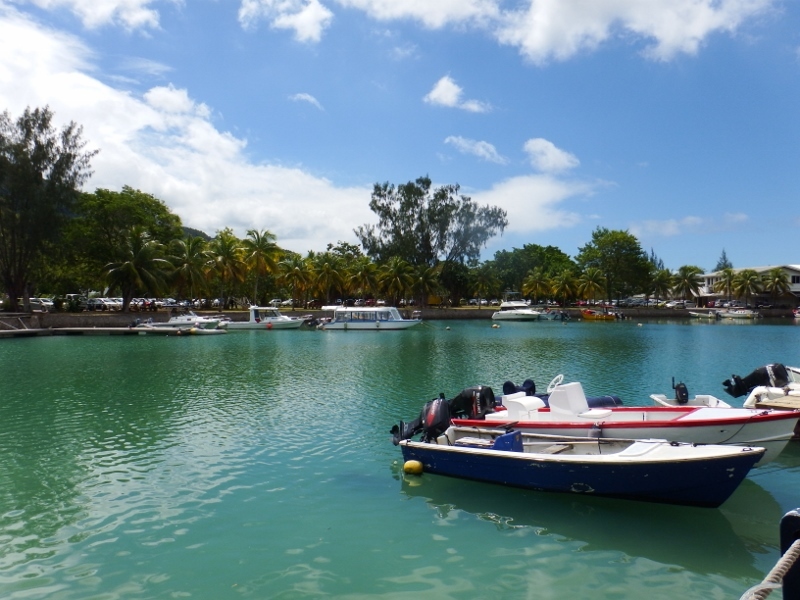 The bay is very pretty with a small marina there but it’s reserved for charter boats. The end of the jetty is where the inter island ferries land. 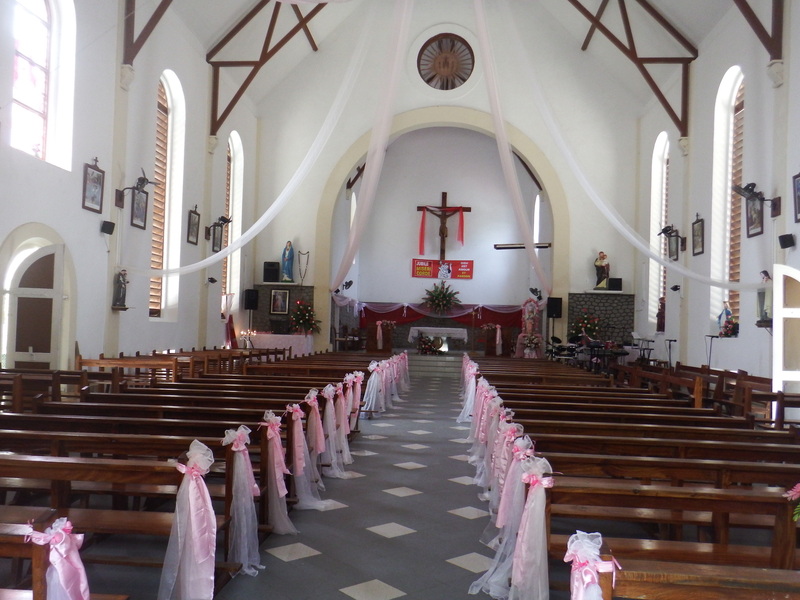 We walked along the waterfront and came across the most beautiful church. I think it had been prepared for a wedding. It was so light and airy inside. Enjoyed a lovely walk around inside. A bit further round the bay we found a lovely little cafe selling the most delicious food for a reasonable price for a change. After a leisurely lunch we continued on our bus journey back to Lazio. After a lovely day Jacqui and Kevin came on board Camomile for drinks that evening. Friday was boat job day and Bill helped Kevin scrub Tintin’s hull while Jacqui and I went for a coffee. Before you say anything hull scraping is a blue job and there are plenty of pink jobs that I do on board. 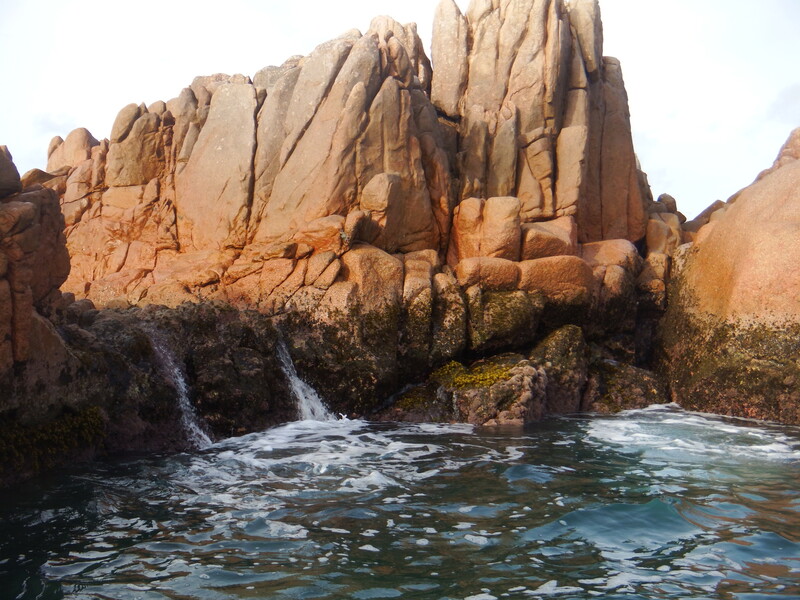 In the evening Bill and I took the dinghy for a tour of the beautiful granite rocks that surround the bay. They are very similar to the ones on Cote de Granit Rose on the northern coast of France. I’ll post a few of my favourite photos. 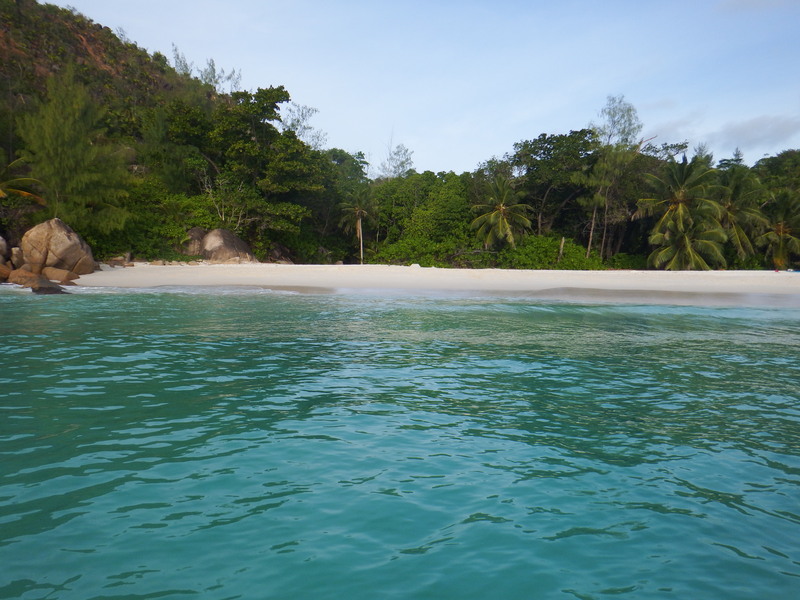 After perusing along the rocks for about half an hour we motored down to the Georgette beach to take a look at it from sea. Yep, just as beautiful and even better with no one on it. If you look carefully at this photo you can see the path we took up to the top. It’s just to the left of center. 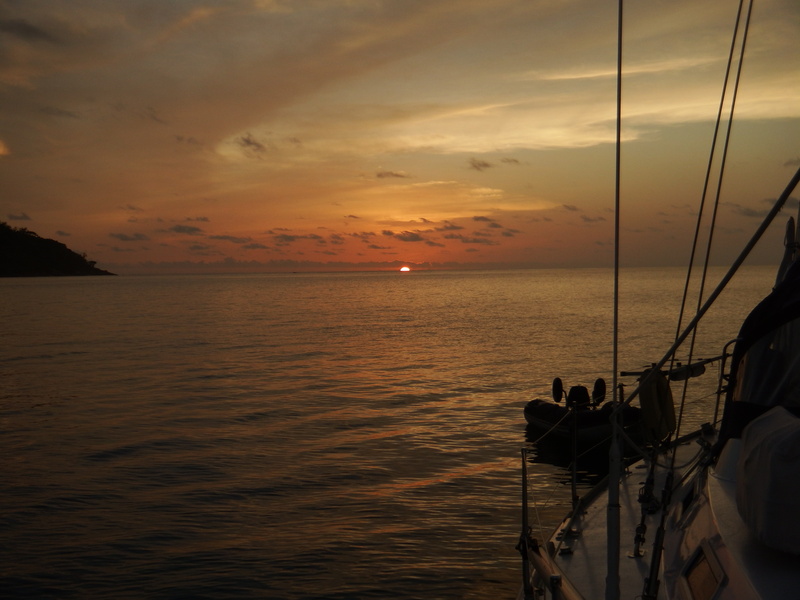 We were back on board just in time to see the sun go down. 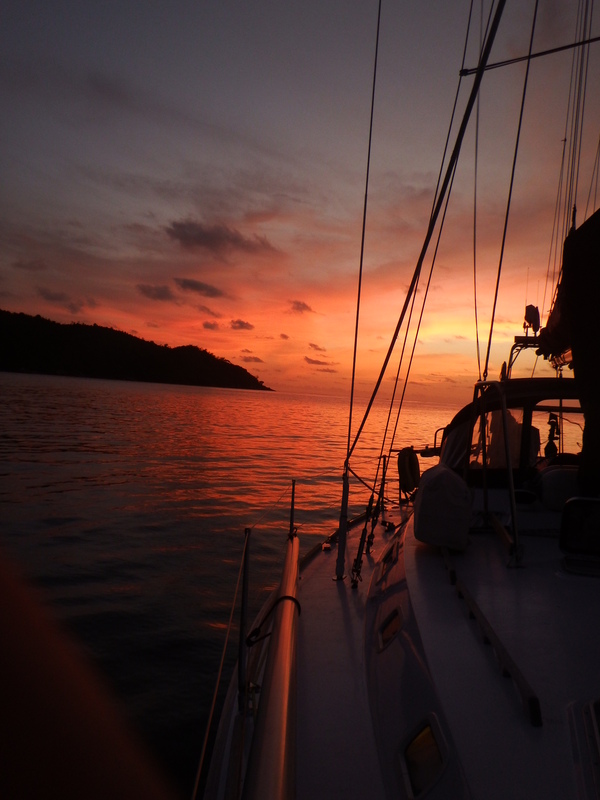 We’ve seen some amazing sunsets from this anchorage. I don’t have a filter on my camera these are the actual colours. 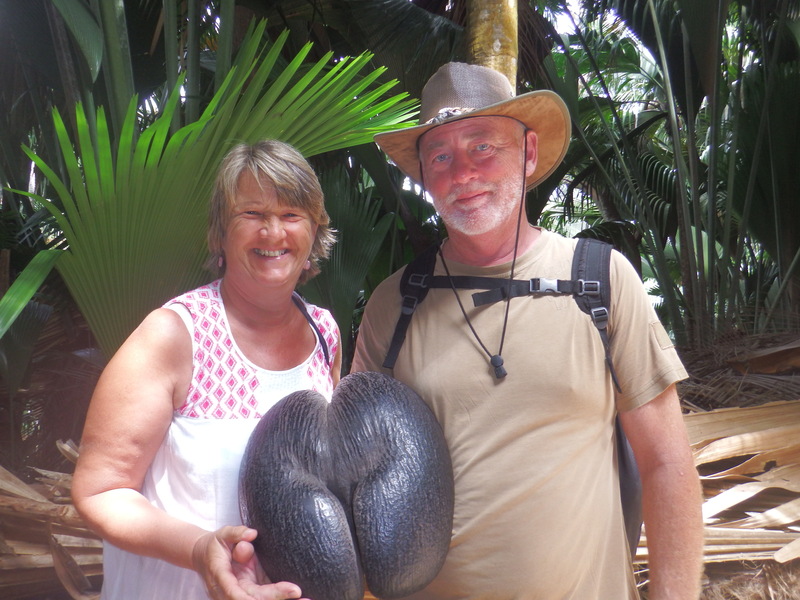 On our last day on Praslin we visited the Vallee de Mai which is home to the worlds largest forest of the iconic Coco de Mer palm. 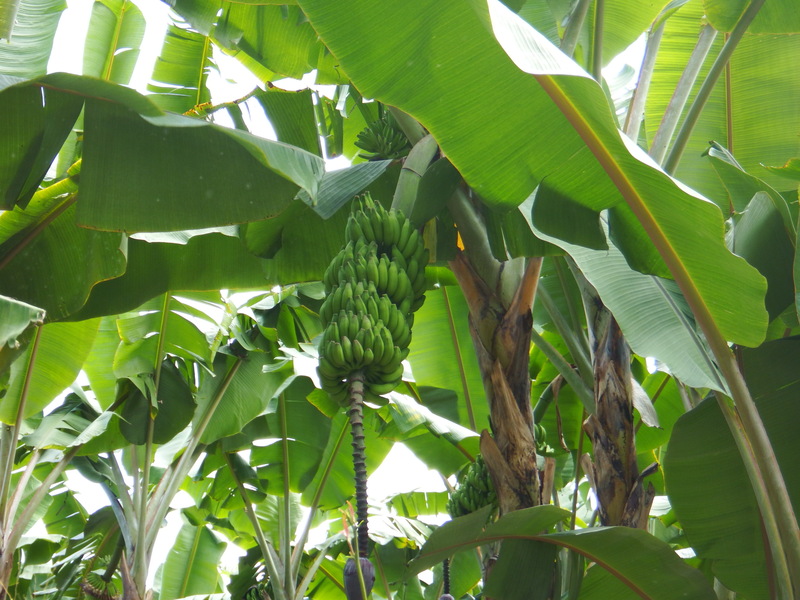 The British general Charles Gordon visited the valley in 1881 and decided that the valley was the Garden of Eden and the coco de mer the Tree of Knowledge. 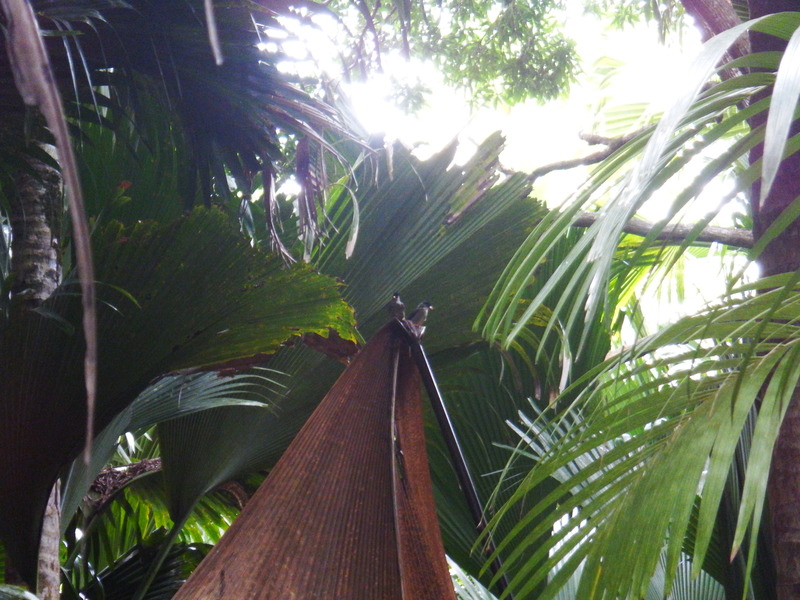 The female Coco de Mer trees bear the world’s largest nut that has the uncanny resemblance to the female pelvis. We were given one of these to handle on the way in but not to take home, they sell for US$200 +/- and are all numbered and certified. The male trees have huge phallic catkins several feet long. 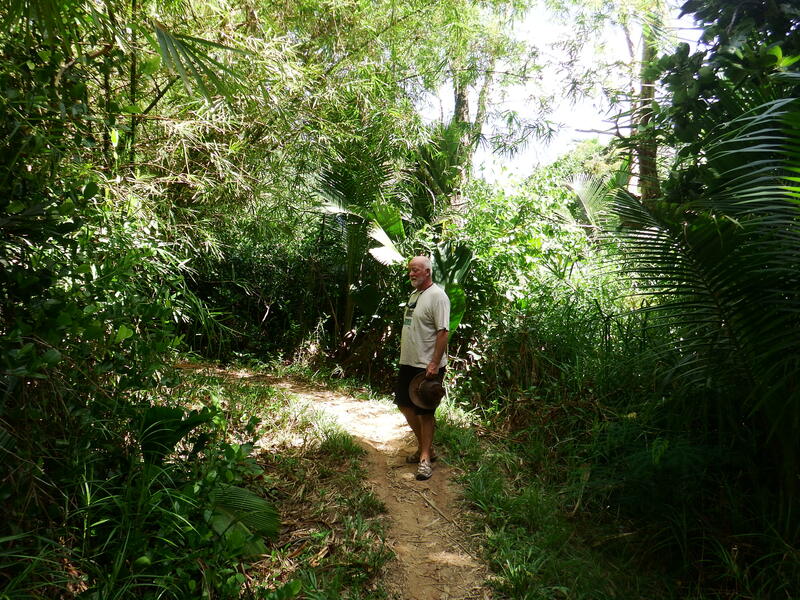 Several nature trails run through the valley and we opted for the middle one. 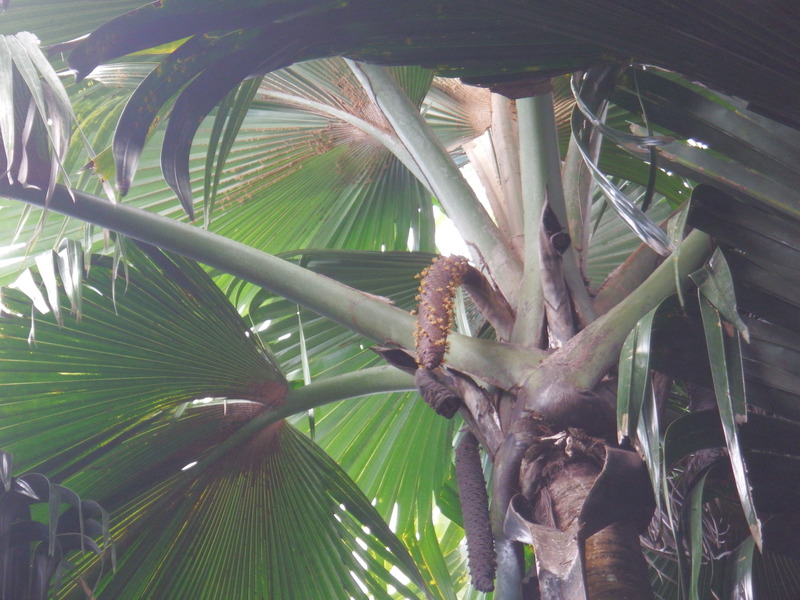 About a quarter of the trees in the valley are coco de mer palms and almost half the remainder are other palms found only in Seychelles. 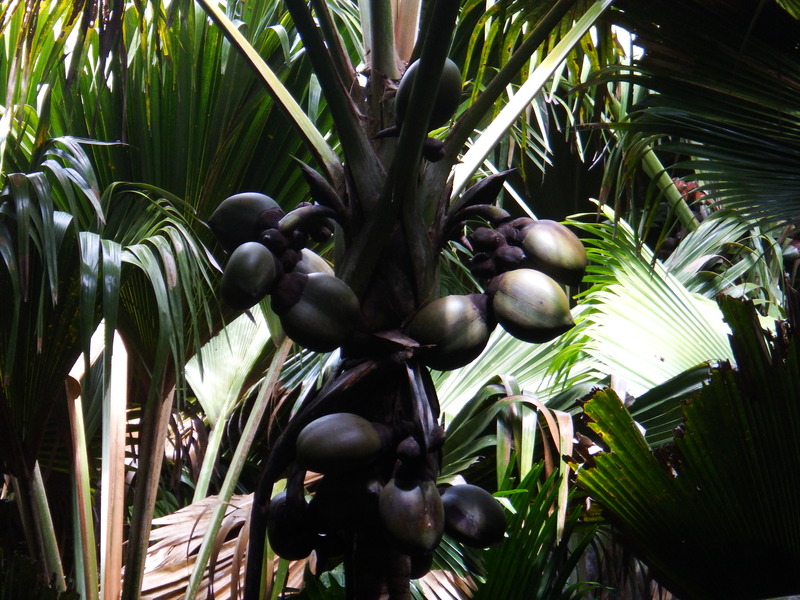 Coco de Mer nuts growing in the trees. 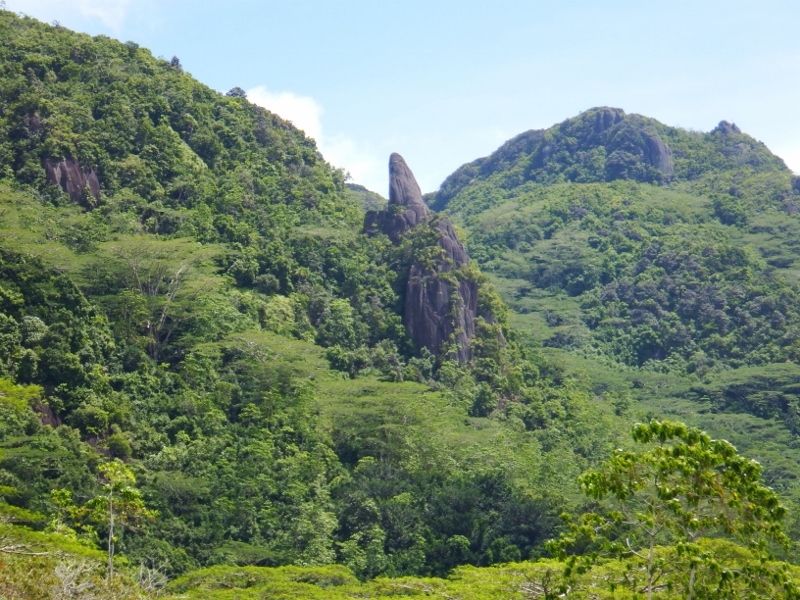 The silence of the valley was broken several times by the piercing whistle of the famous black parrots, which only breeds on Praslin, but alas the forest was very dense and we couldn’t see them, just these two Bulbul birds. I wouldn’t normally post photos of spiders but these female spiders were huge, easily the size of my palm. The male of the species is much much smaller and sits on the edge of the nest waiting until she is distracted by eating before he ventures forward to mate with her. If he’s not careful she’ll eat him too – what more can I say! 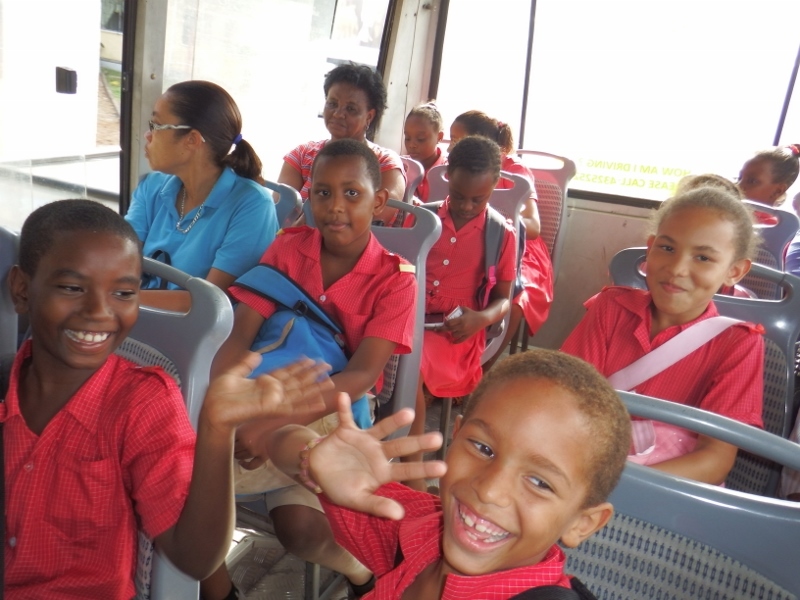 After spending an hour or two in the park we caught the bus back to St Anne’s bay for another delicious lunch in the little cafe before catching another bus back to anse Boudin and doing our final walk over the hill. 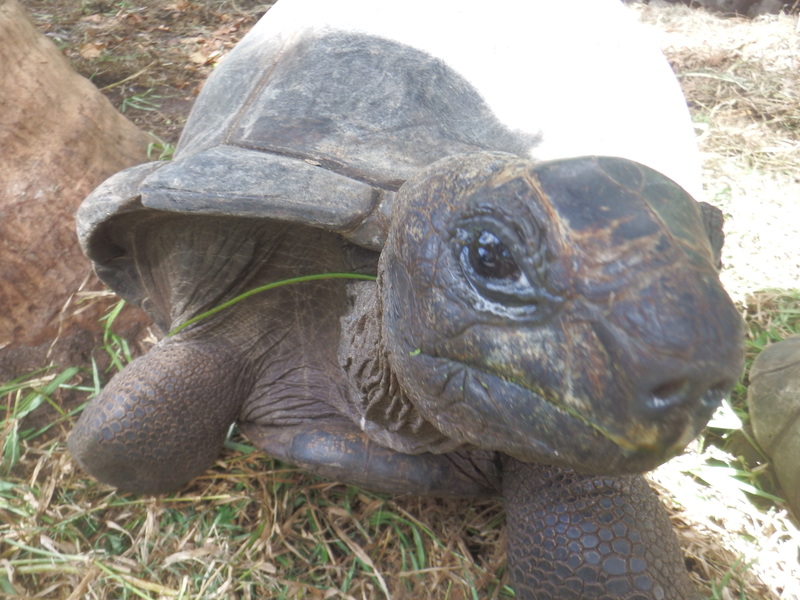 In the gardens of one of the restaurants at Lazio they have some giant tortoises. They are lovely old things moving slowly to the next piece of food. Their shells are the size of a good sized dustbin lid. There were about a dozen of them. 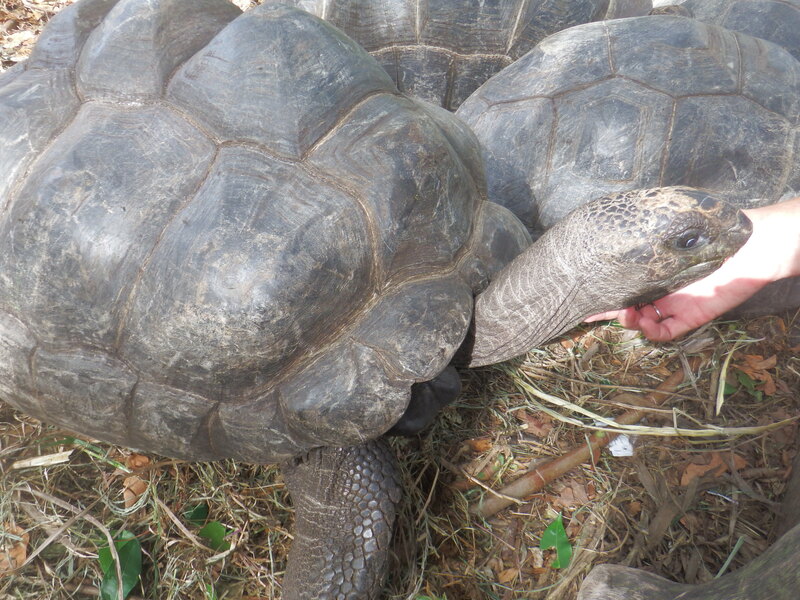 Not sure how old they are but there’re another things Seychelles is famous for. 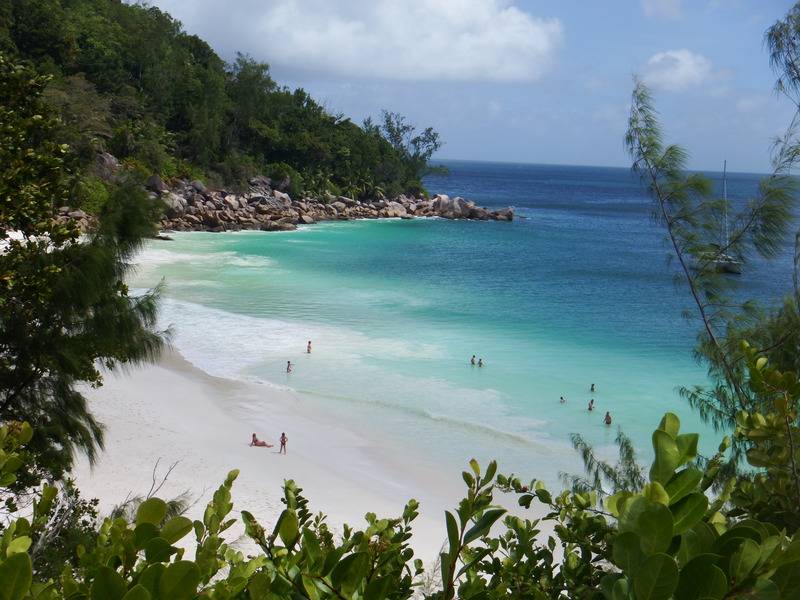 The next day, Sunday, we headed back to Victoria with Tintin to get ready to leave Seychelles. On the way back Bill performed a radio check with several other boats and was ‘slightly cross’ when he discovered the radio STILL wasn’t working. All that work. 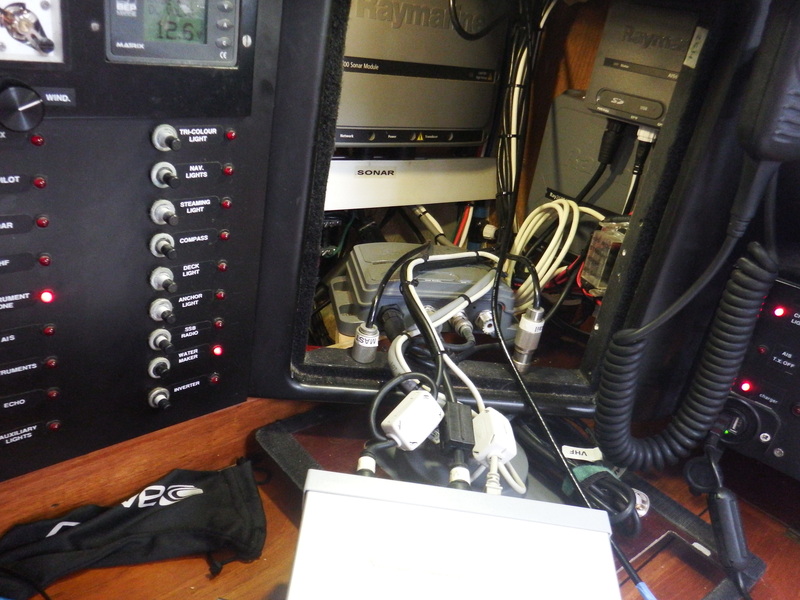 The new aerial was now working but all the tests indicated it’s the 2 year old Raymarine radio that was replaced after the lightening strike. Lucky we still have an old one on board as a back up. The Raymarine will have to wait to South Africa to sort out now. Grrrrr! 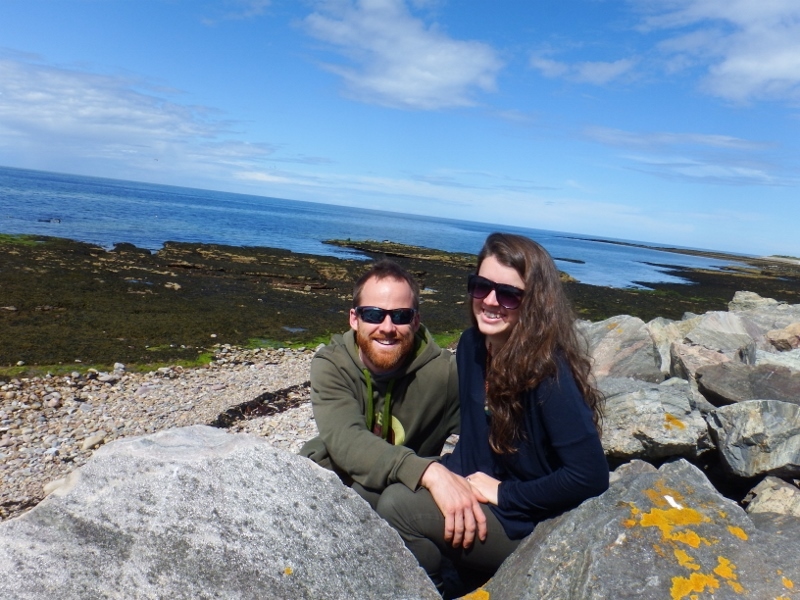 We arrived back on Camomile Saturday 9th July after a wonderful 3 weeks in the UK. As usual we hit the ground running and I spent the first day unpacking, putting away my nicely washed and ironed clothes, disentangling Bill’s bits from all 4 bags and repacking winter clothes back in the bags so they could go back under the bed. They don’t cost anything but you need to ask the locals if it belongs to anyone or you could find yourself being asked to move. Anchoring isn’t very good here although we managed to get our anchor to stick on the first night. 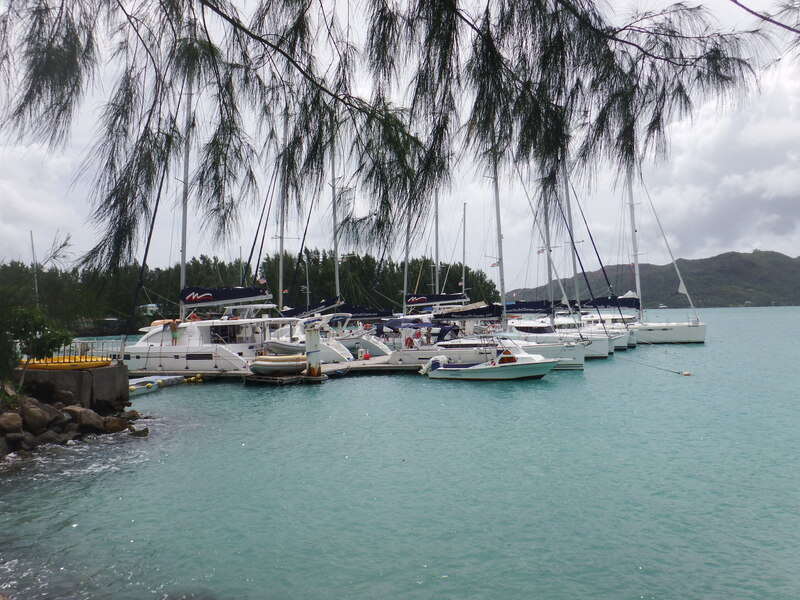 Monday morning we went ashore to join the yacht club. For 125rupees (about £7) for the week you can use the (hot!) shower, dump your rubbish, use their water to fill water jugs or do washing and leave your dinghy safely on their pontoon, good value really. 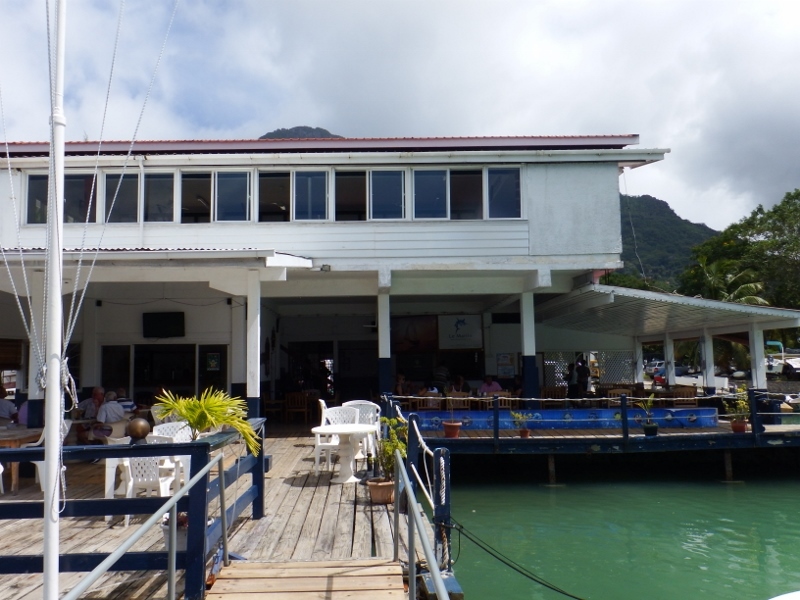 The next job was shopping because there wasn’t anything on the boat to eat after our time in Chagos and the UK and its very expensive eating out here, although the YC does some reasonably priced meals. The big supermarket is a 10 minute walk out of town so with a trolley each we went to stock up. Tuesday I decided to restart my joggy trots. I haven’t been able to run for months because I’ve had a ‘planters’ heal which was very painful although it’s finally stopped hurting but mainly because it’s been too hot. There’s a little park overlooking the boats so I did a couple of circuits of that. We spent the rest of the day on board because we’ve both developed colds, probably from the plane, and Bill’s is developing into man flu with an infected eye and ear. That evening Jacqui and Kevin of Tintin moored next to us invited us on board for drinks to welcome us back. It was nice to relax and chat for a few hours. Wednesday we played tourist for the day and did the walking tour around Victoria. 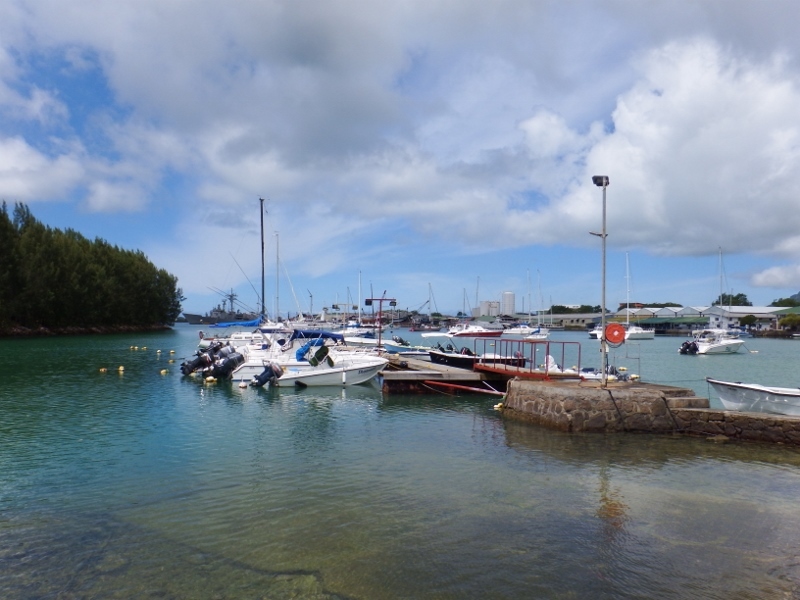 It was founded on this spot by the French in 1778 and called L’Etablissement because of its excellent natural harbour with shelter provided by St Anne and neighbouring islands. 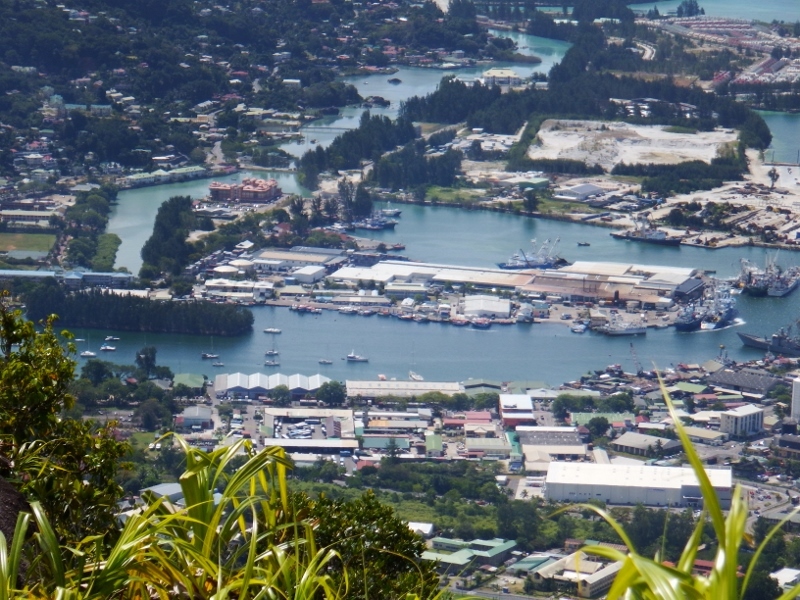 After the British captured the Seychelles in 1812 the little capital was given its English name in 1841 in honour of Queen Victoria. Many of the population today is trilingual with French being the main language but English and Creole is widely spoken too. The clock tower in the centre is the very symbol of Victoria. 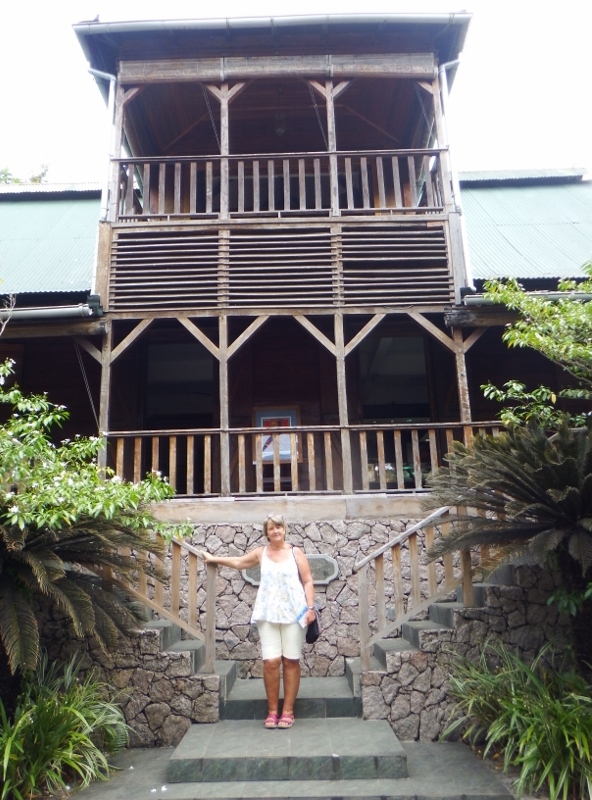 It was erected as a memorial to Queen Victoria who died in 1901 but it took until 1903 to reach the Seychelles. The clock arrived in kit form and, in a mishap during unloading, the pendulum was dropped over the side of the ship. Despite a makeshift substitute being made locally the chime was disabled. Most of Victoria east of the clock tower has been built on reclaimed land. 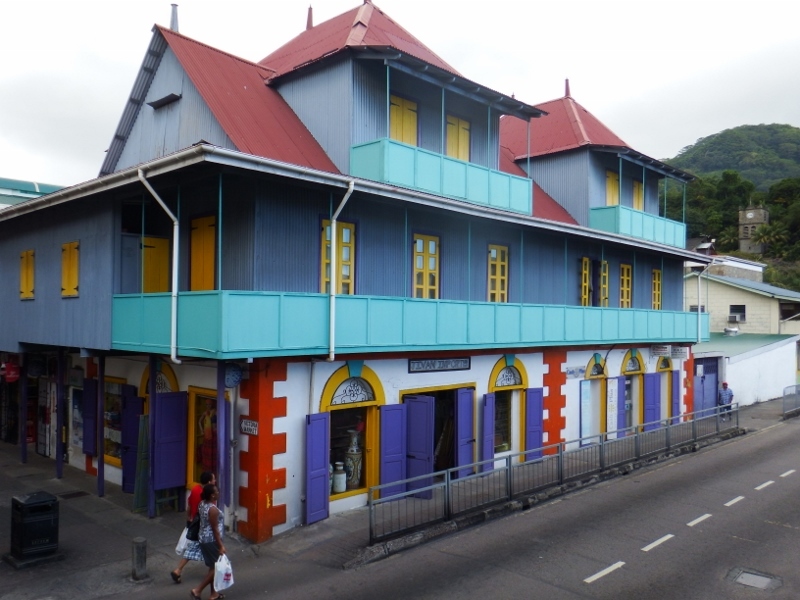 We walked down Francis Rachel street which was once the waterfront and many of the old buildings still survive here. One such building is Kenwyn house. It is one of the best preserved 19th century buildings in Victoria. Apart from the architecture of the building itself it contains some beautiful art work from local artists. There were several pieces Bill and I liked but the price tags were way beyond our budget. 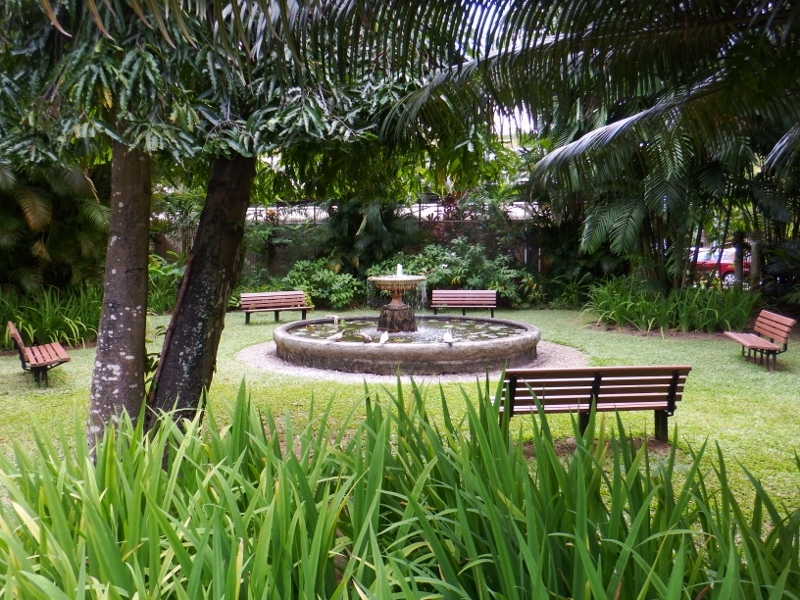 This lovely little fountain was in the garden. 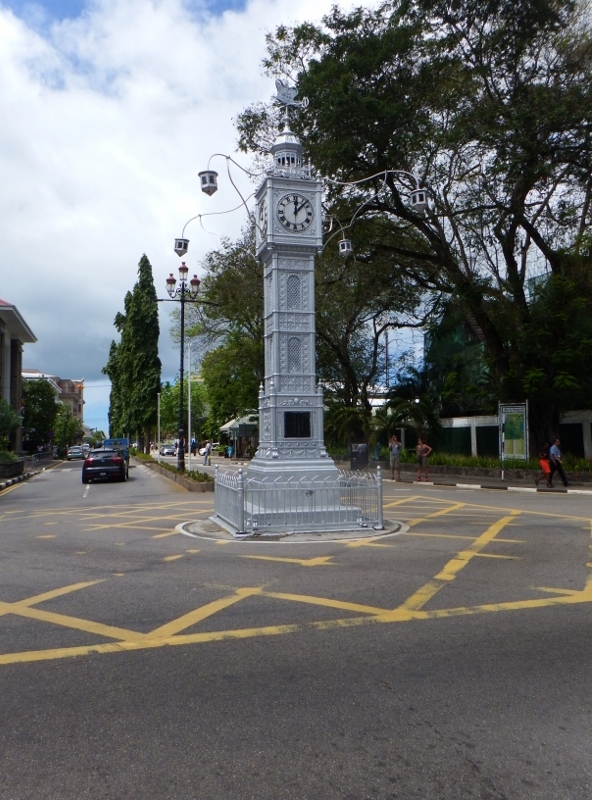 The Seychelles gained independence from the British in 1976 and the road built on reclaimed land leading from the clock tower is named Independence avenue. 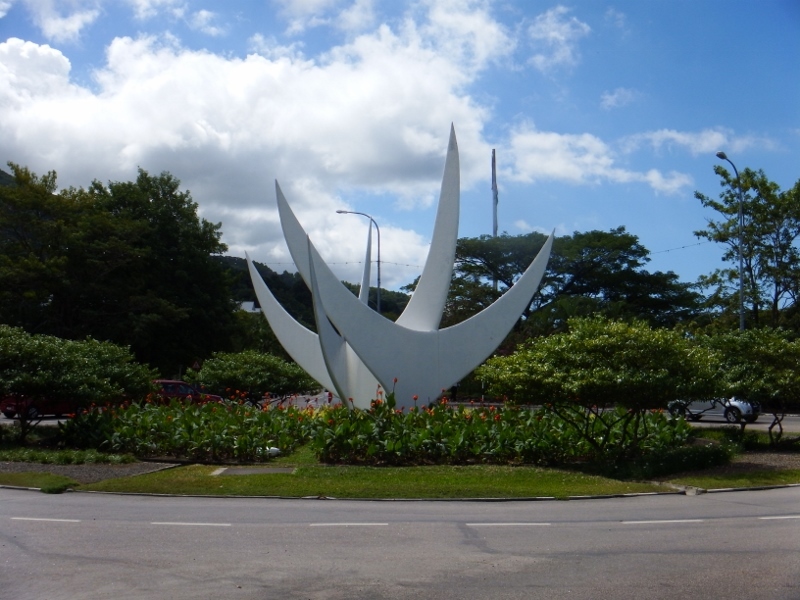 At the end of the road is a roundabout with the Bicentennial Monument known as Trwa Zwazo (three birds) erected in 1978 to celebrate 200 years of human settlement in Seychelles. 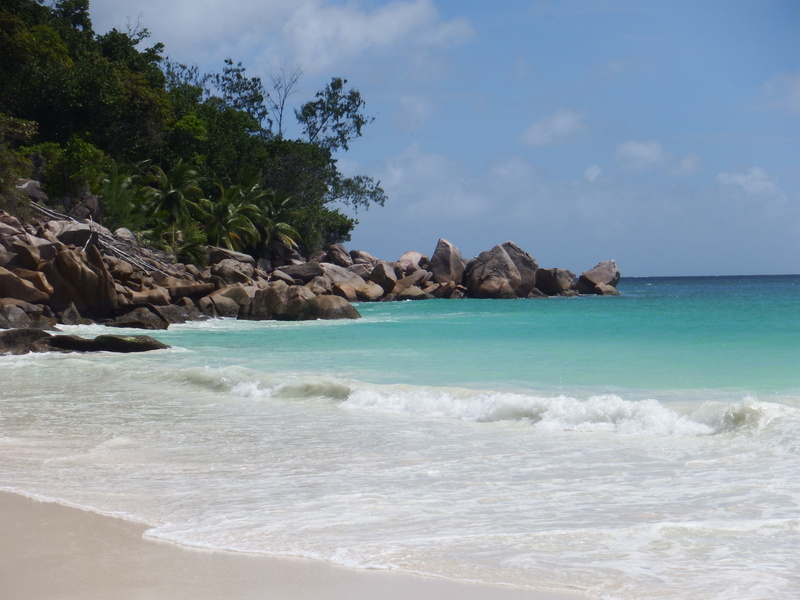 Each ‘bird’ represents one of the continents in the blood of the Seychellois: Europe, Africa and Asia. Do they look like birds? Back to the clock tower again and a walk north on Albert street, also part of the original sea front, to find this very colourful building on the corner of Market street. 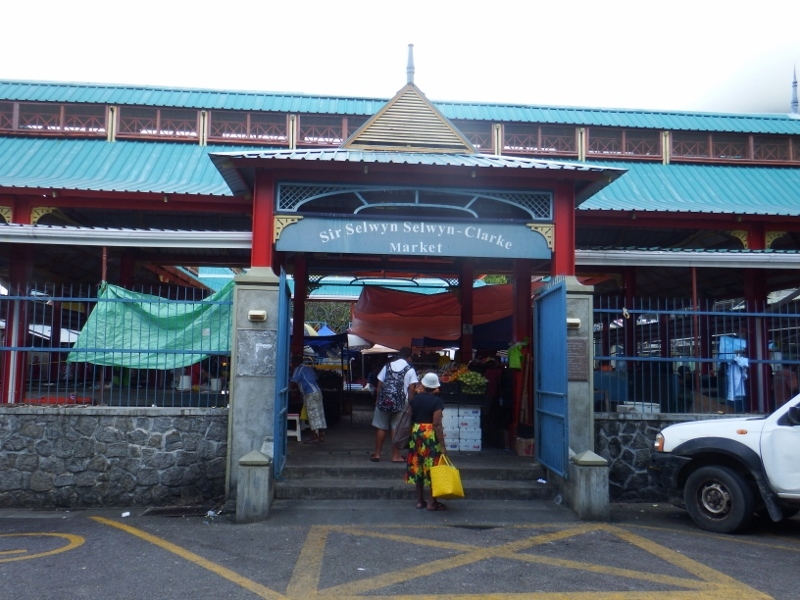 Market street, part of the old town and pedestrianised, leads to the Sir Selwyn Selwyn-Clarke market named in honour of a former governor. We had a quick look around but weren’t shopping today. 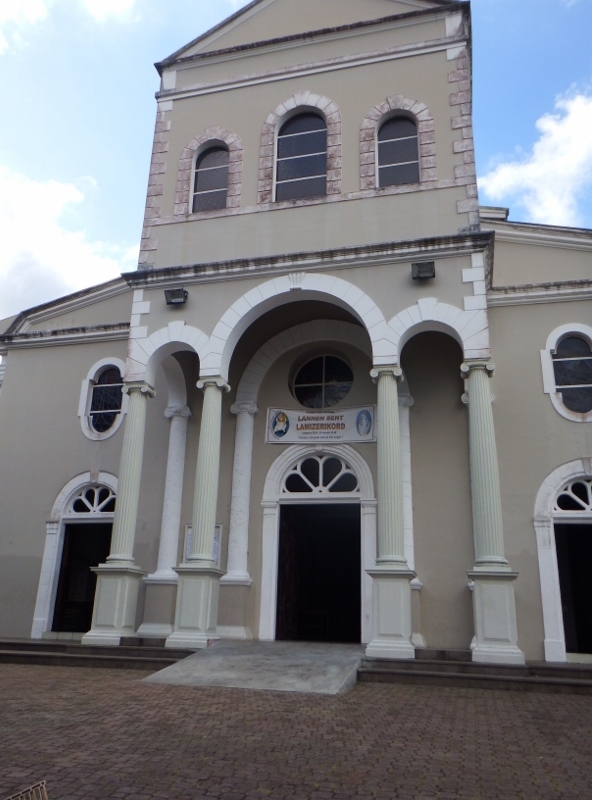 Church street leads from Market street to the roman catholic cathedral named Cathedral of the Immaculate Conception. Little remains of the original building dating from 1874, having been rebuilt in granite is 1933. 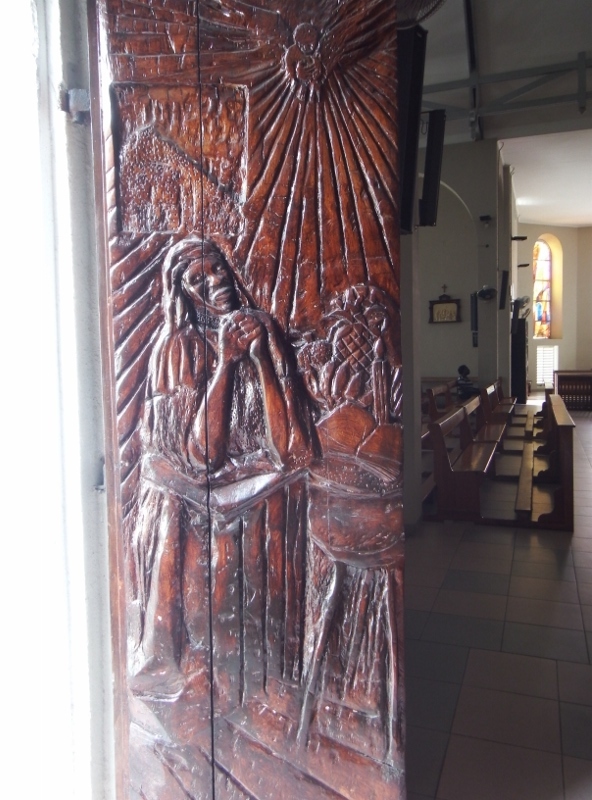 One of the original doors has been fitted to a side entrance. 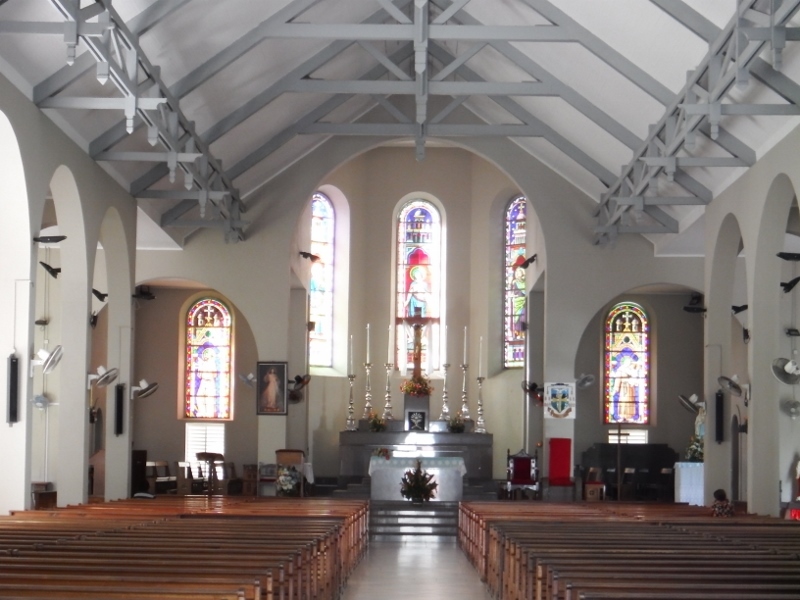 I love old churches and this one was beautifully kept. The stain glassed windows were striking. It was wonderfully cool inside. 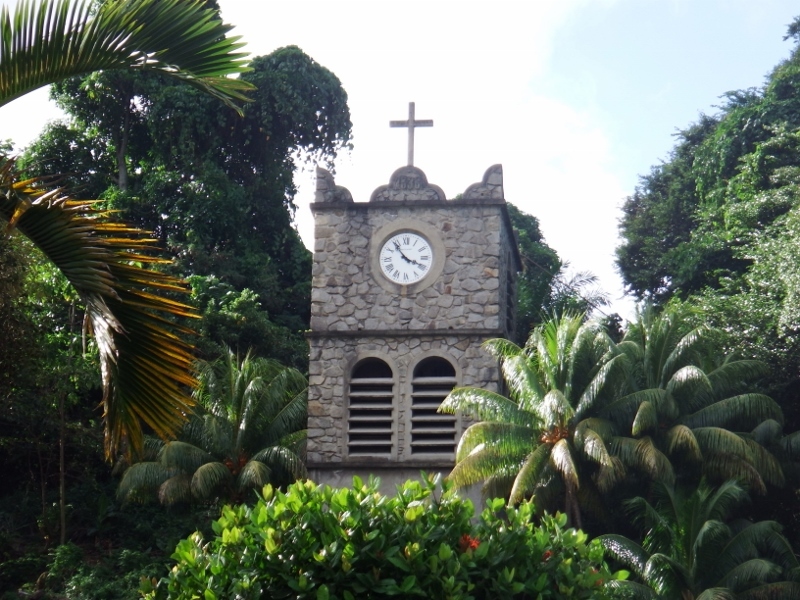 Part of the original clock tower was set on the hill behind the cathedral. 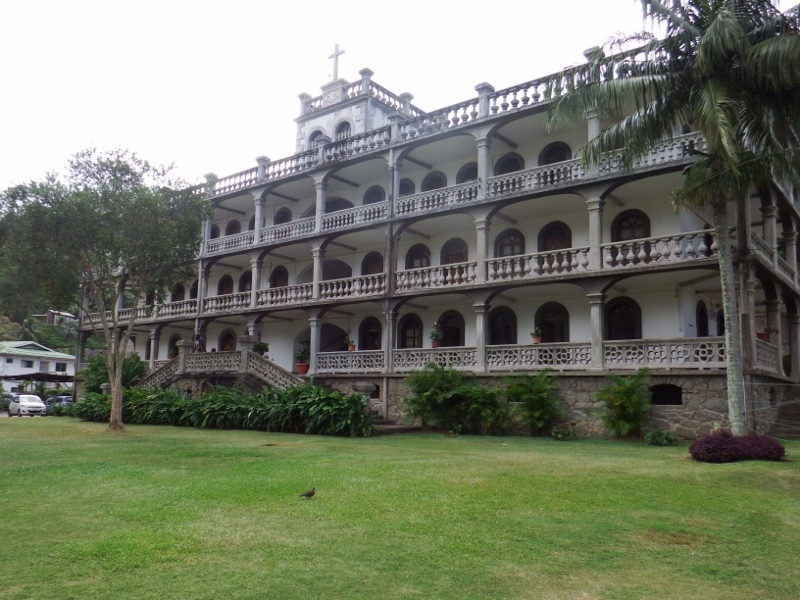 One of Victoria’s most impressive buildings, the Catholic priests’ Residence, Capuchin House stands beside the cathedral. That was the end of the walk but on the other side of the cathedral is an orphanage and these dear little ones were sitting outside the cathedral with their house mother. 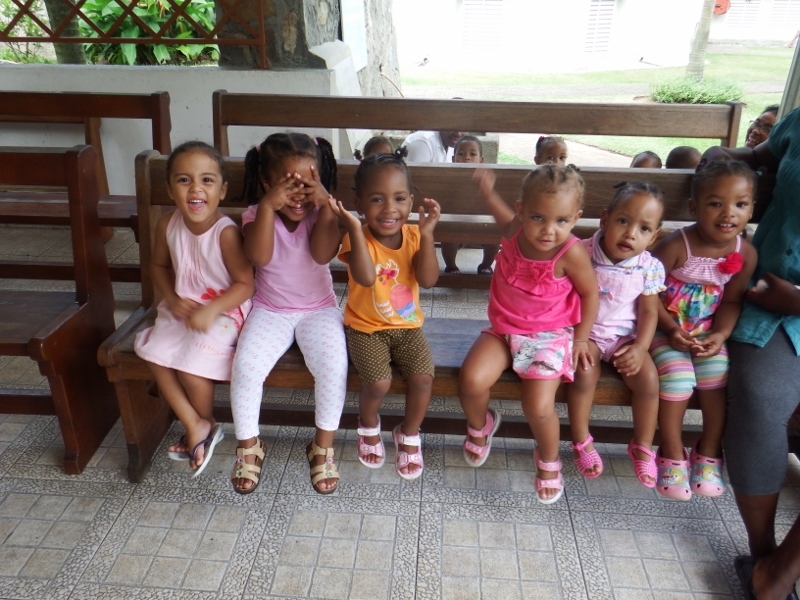 Their ages range from 18 months to 3 years, I just wanted to take them all home they were adorable. On Thursday we had another tourist day with Tintin and got on a bus. Public transport is very reasonable here. It costs 5 rupees (about 30p) a ride whether you go one stop or all around the island. 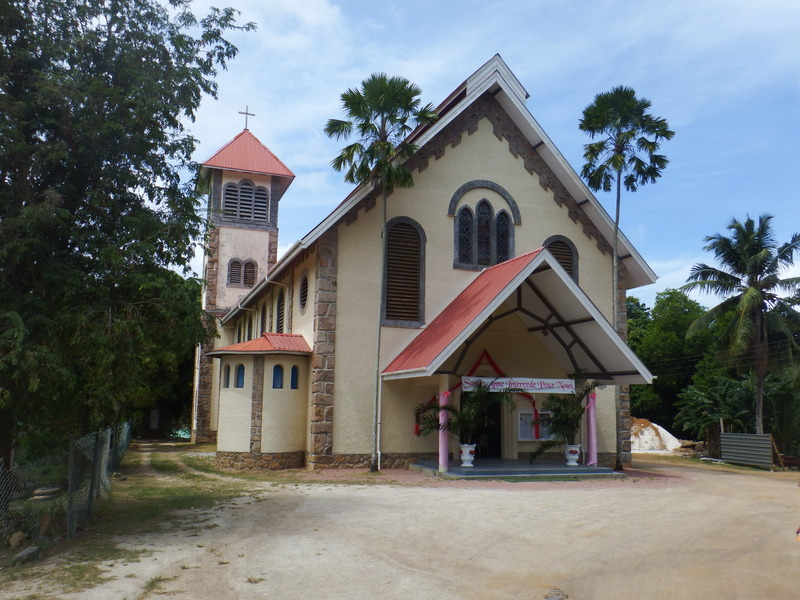 We headed out of town on the Bel Air road passing the oldest cemetery in the Seychelles. 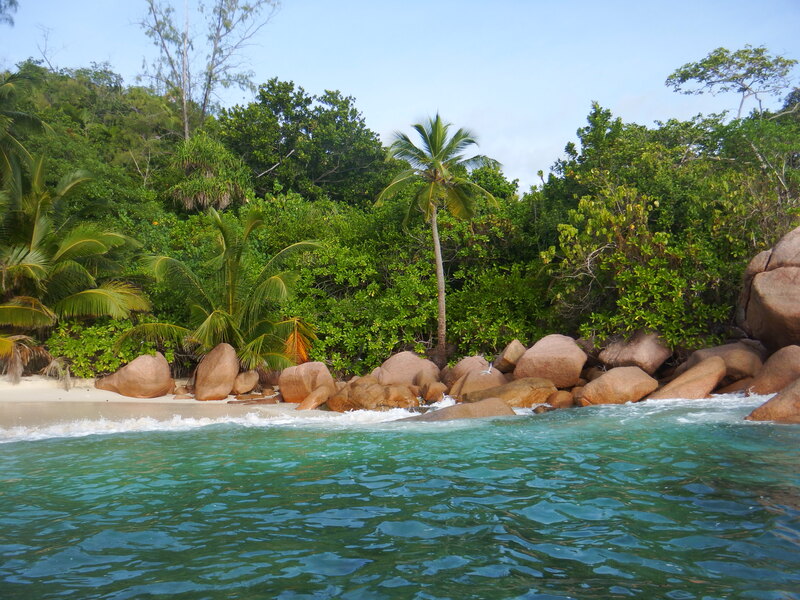 Here lie some of the pioneers of the settlement of Seychelles. Leading onto the Sans Souci road it twists and turns upward. We got off by the Mission historical ruins to visit the viewpoint erected for the state visit of Queen Elizabeth II in 1972 on her tour of the Commonwealth Nations. 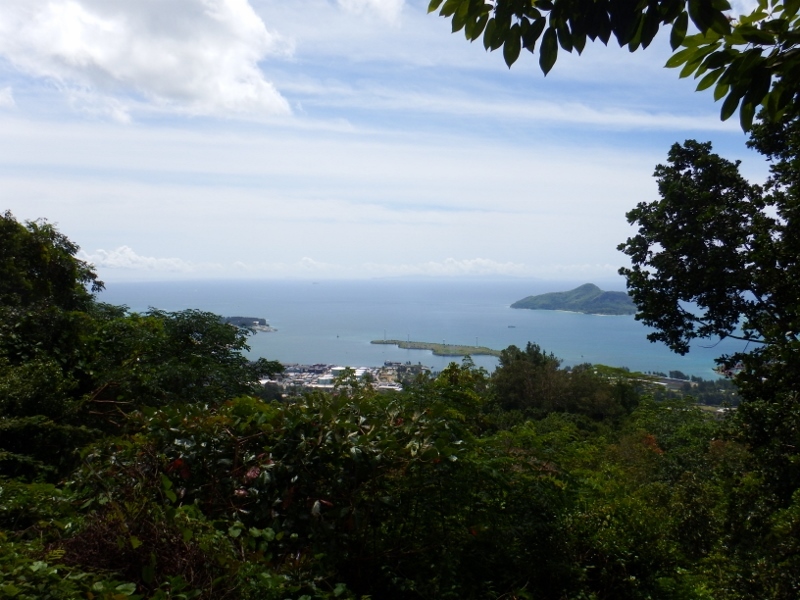 Often there are misty clouds shrouding the mountain tops but today we were lucky and had a good view out across the islands, although the trees have grown a bit in 44 years. We all walked back down the road to the Copolia walk which took us about half an hour. 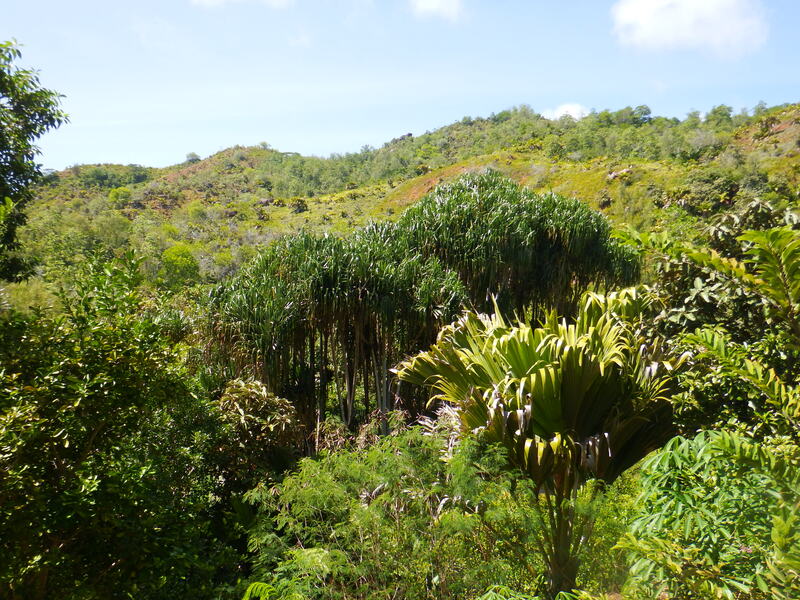 The scenery was stunning as we walked passed endemic palms, trees and screwpines. The traffic was very infrequent so it was a pleasant walk. The Copolia is only about a mile in length but is uphill using tree roots as steps along with steps cut out of the granite. There were many wild flowers growing along the way, not unlike Scotland although about 20C warmer! We were told it was a 45 minute walk but it took us a good hour and a half but we finally made it to the top and what a stunning view. 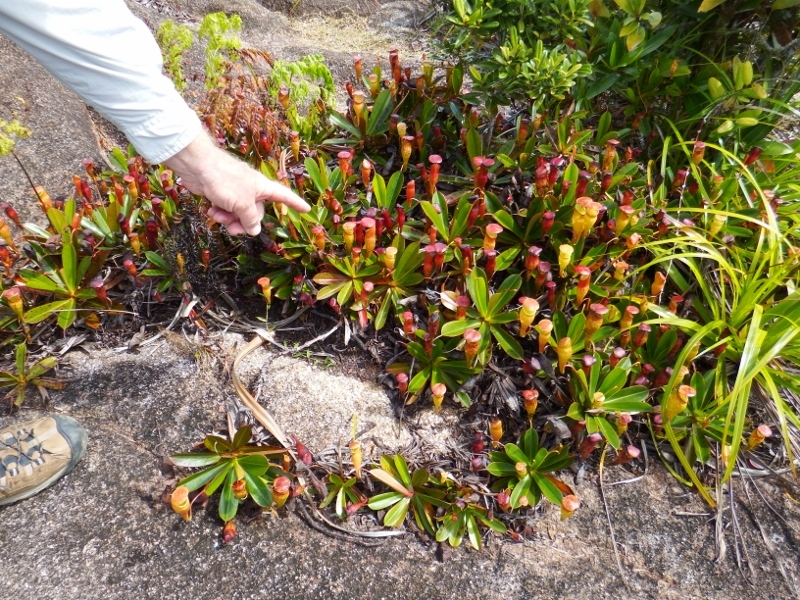 One of the reasons to come to the top, apart from the view, was to see the Nepenthes genus of pitcher plants. 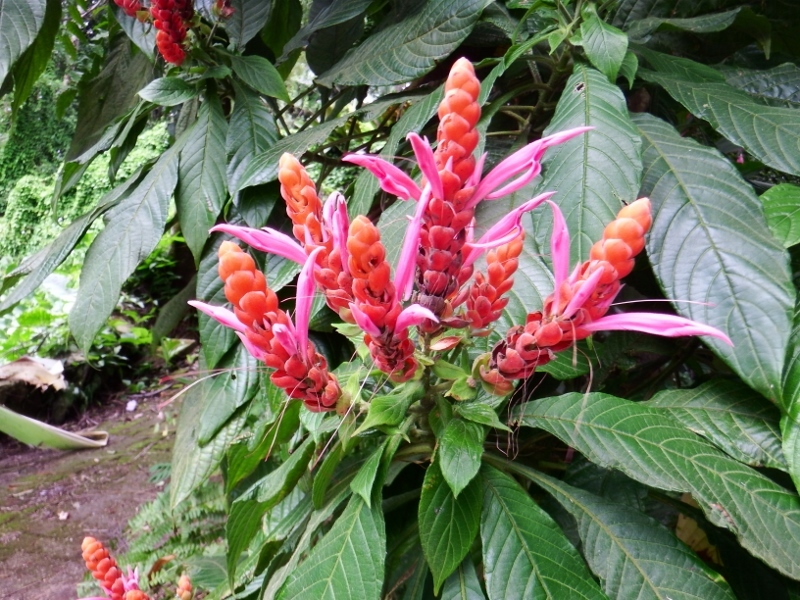 Of 70 species in total all but two are in south east Asia. 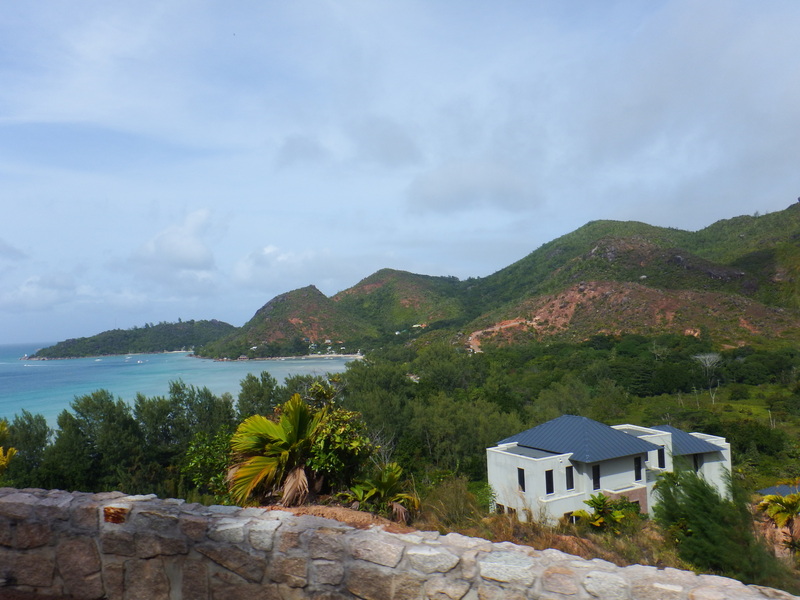 The exceptions are in Seychelles and Madagascar. They were quite small and grew in clumps on top of the mountain. As we looked down to the north we could see Camomile and Tintin in the harbour. 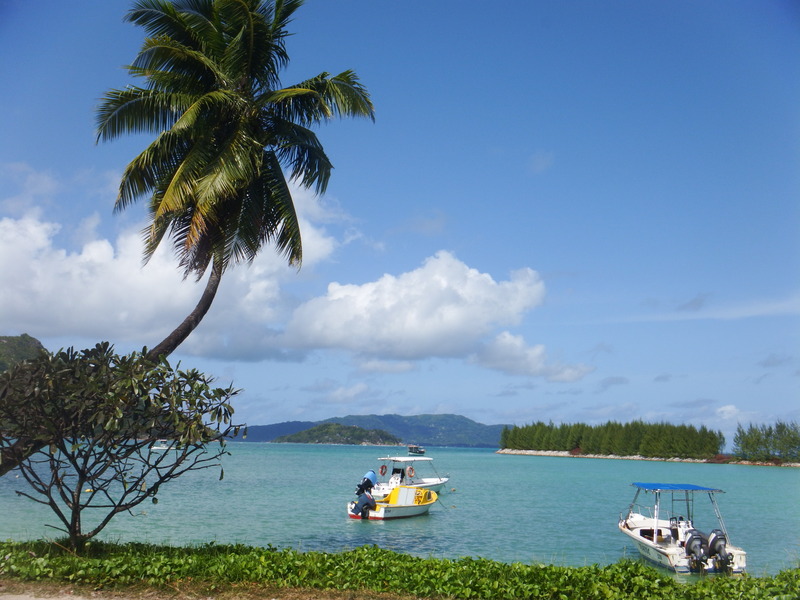 In front of us to the east was Eden island with Norsa sitting in the marina. 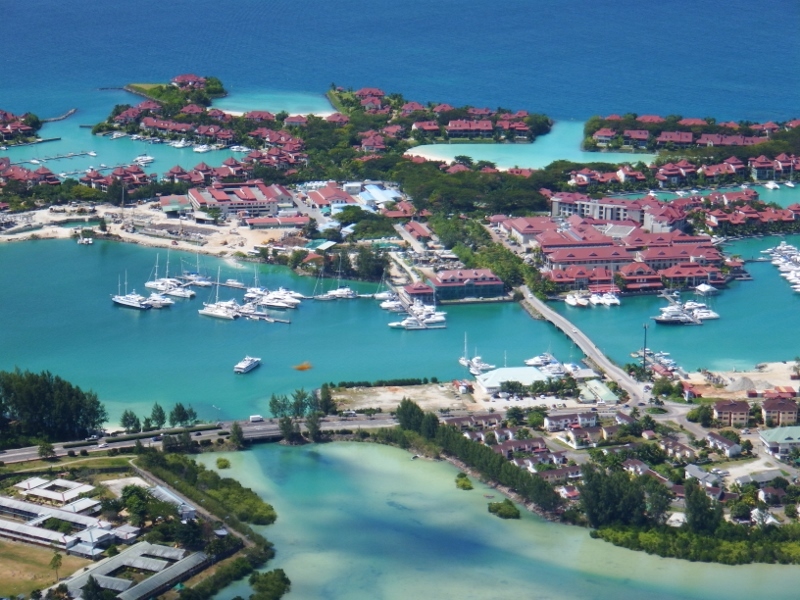 In this panoramic shot the airport is off to the south (right of the photo) and the islands of the St Anne national marine park beyond the marina. That was where we headed the following week and took this photo. The peak we were standing on is in the middle of the photo. 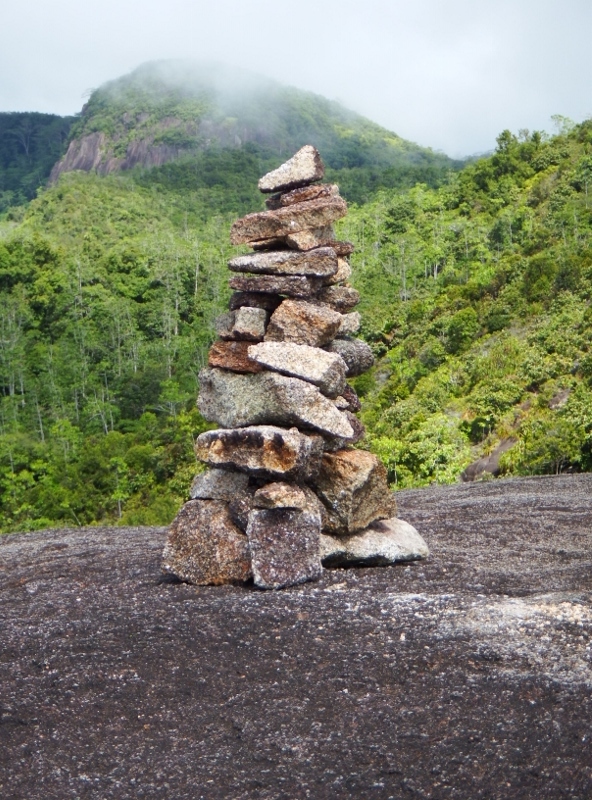 My final photo taken on the mountain is of one of the many cairns that have been built in memory of loved ones. The walk back down wasn’t as difficult but still took us nearly an hour. Unfortunately the bus stop was another 20 minutes down the road so we had to walk to that before our poor feet and knees had a rest. These dear little school children joined us on the journey back down the hill. We spent the rest of the week trying to shake off our colds. and oh my goodness didn’t those three weeks go quickly but we managed to do quite a lot. The party was a huge success and to see the look on the boys faces was worth the effort to get back on time. The next day was Father’s day and Bill hasn’t had Father’s day with the boys for years so we celebrated with a wonderful breakfast cooked by Thomas. I even took my coat off for a few hours! 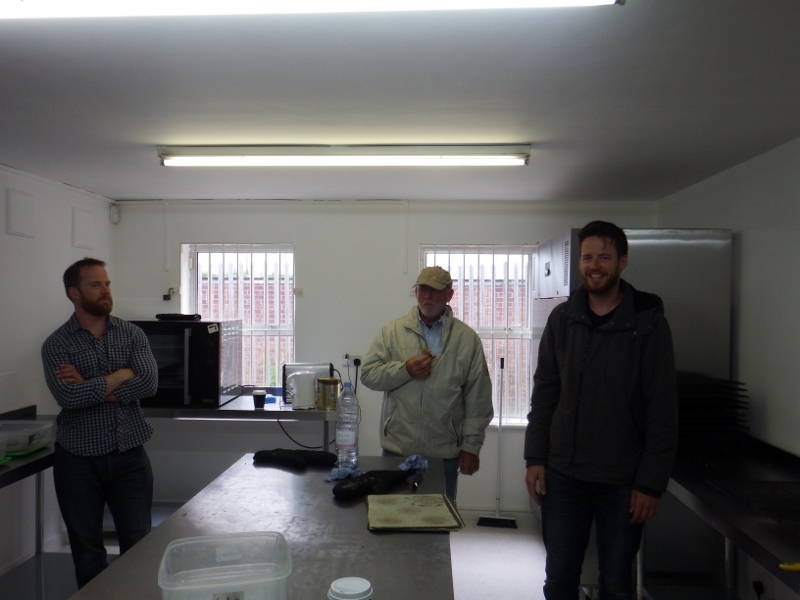 We hired a car Monday morning and drove to the other side of Maidstone to see Thomas’s new unit, the new headquarters of the Thomas Cookie co. Bill and I had very proud of what Thomas has achieved in just over a year and with Sonal’s help. It turned out to be a good time to arrive because Thomas was grateful for Bill’s help with sorting out some shelving and other bits. 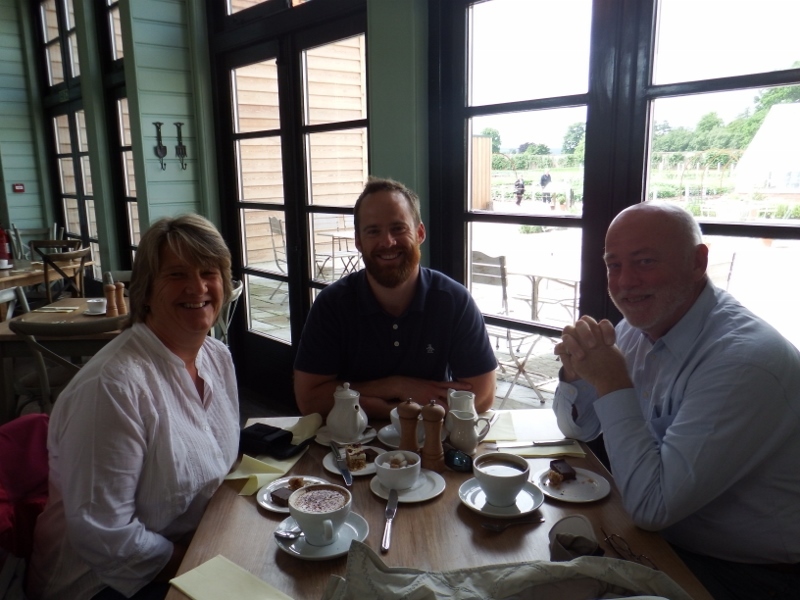 After making some plans the four of us drove into Maidstone for a coffee and a chat. It felt so strange walking around the town together after so long. Sadly James had to leave in the afternoon to fly back to Scotland. Had he known we were coming he would have stayed longer but we planned to go to Scotland the following week. Tuesday we got onto the motorway to drive to Basingstoke to see my sister. There’s so much traffic here and after travelling everywhere at 6kts it felt strange going so fast. 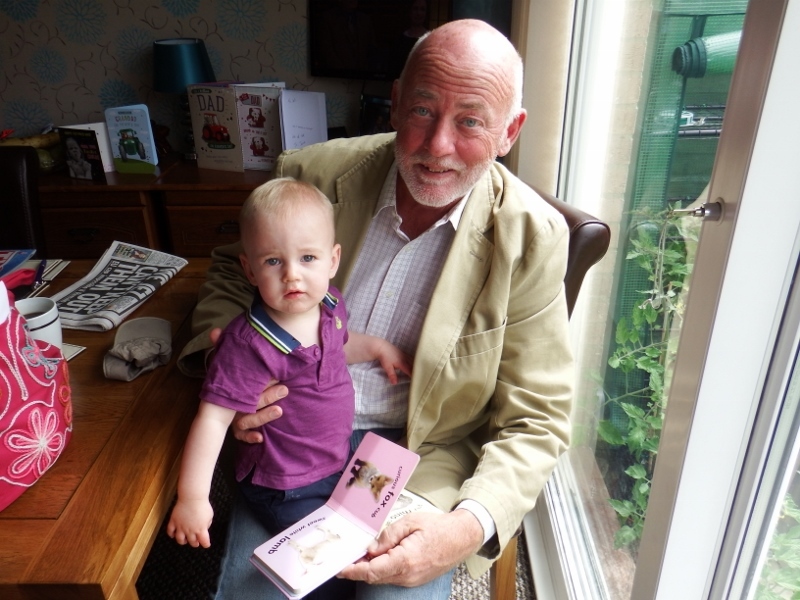 Angela looks after her grandson Logan, my great nephew 3 days a week and it was good to see him again. 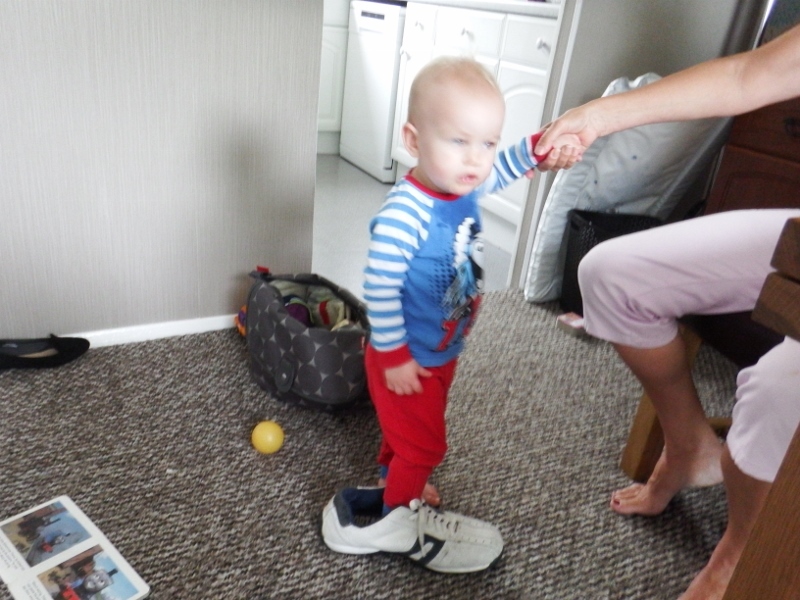 When I was in the UK last May he was a babe in arms but now he’s walking around very cheekily including in Uncle Bill’s trainers! We spent 2 days there but after we left I realised I didn’t get a photo of me with him but I love this one of Bill in training to be a Grandpa! We had a lovely meal out with Angela and Terry on the Tuesday evening and a nice meal in on Wednesday with my niece Kirsty too. Thursday was a busy day. 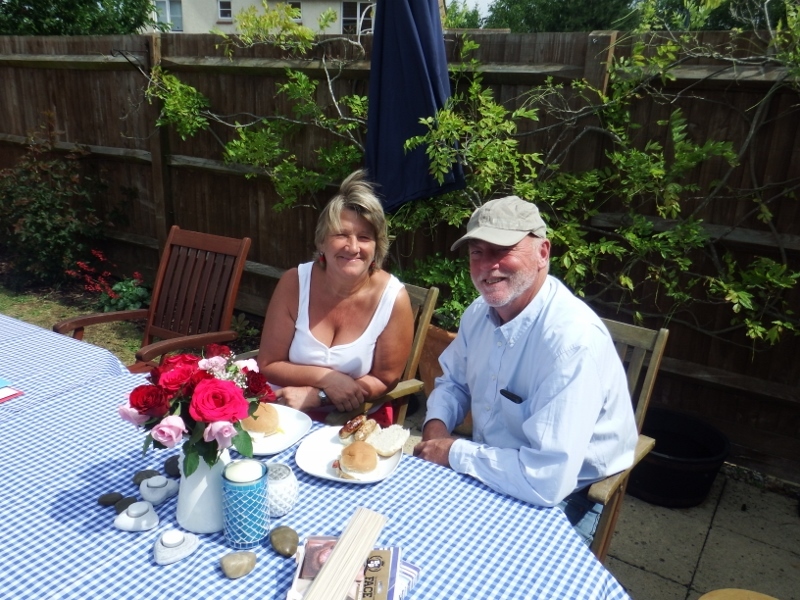 After laying some flowers on my Mum’s grave we drove to Pitton to see Bill’s Auntie Hilary and Uncle John for a lovely chat and a delicious lunch. After leaving in the afternoon we drove to our sister-in-law Claire and Gordon for a light supper, more chatting and a comfy bed. Friday we paid a quick visit to our lock-up to leave a few bits there (there really isn’t any more room). I always feel sad when I see our ‘treasures’ stacked floor to ceiling – I wonder when they will all come out one day into a home? We continued onto Port Solent and the marine superstore to start buying the many items needed to take back. Another grave in the afternoon, Dad is buried in Littlehampton and doesn’t get visited very often so it needed a bit of TLC. Finally we completed the loop and ended back in Maidstone in Thomas’s unit and I helped make some cookies. I was paid in cookies too, yum yum. Saturday saw us visiting the chandleries of Gillingham and Chatham for more bits as well as some clothes shopping. 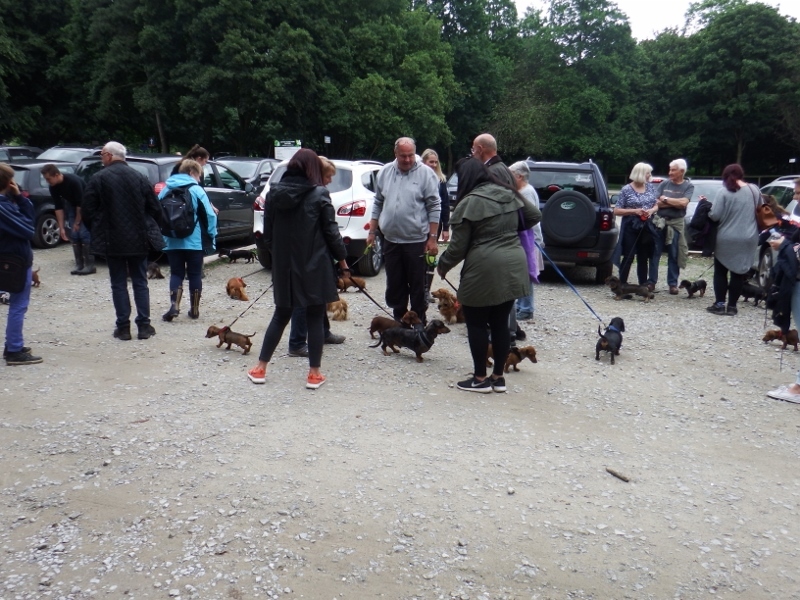 Sunday was market day but while Bill went to help Thomas on the stall I went with Sonal to walk my ‘grand-fur-baby’ Slinky with the other dogs of the ‘Sausage dog club’ at Cobtree park north of the town. It brought back fond memories because I used to walk Nike there. 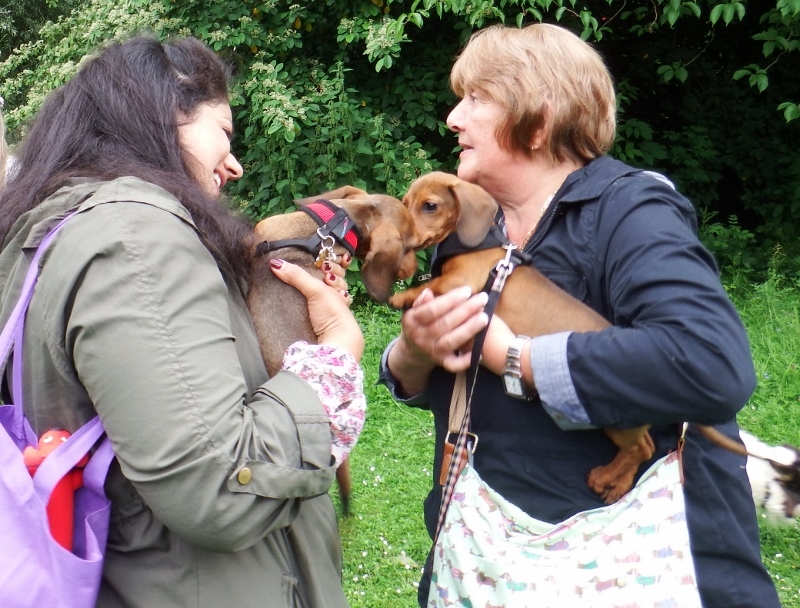 Slinky is only 4 months old so can’t walk far but he enjoyed meeting his buddies. It was wonderful to spend time with Sonal and enjoyed our walk together. Middle of summer and we all had coats on again. This is Slinky’s brother and is the first time he’s seen him since leaving the litter, I wonder if he remembered him. After our walk Sonal and I drove to West Malling to see Thomas on his market stall. Also my other sister Amanda, my brother-in-law Alan and nephew and niece Tristan and Jasmine came to see us. 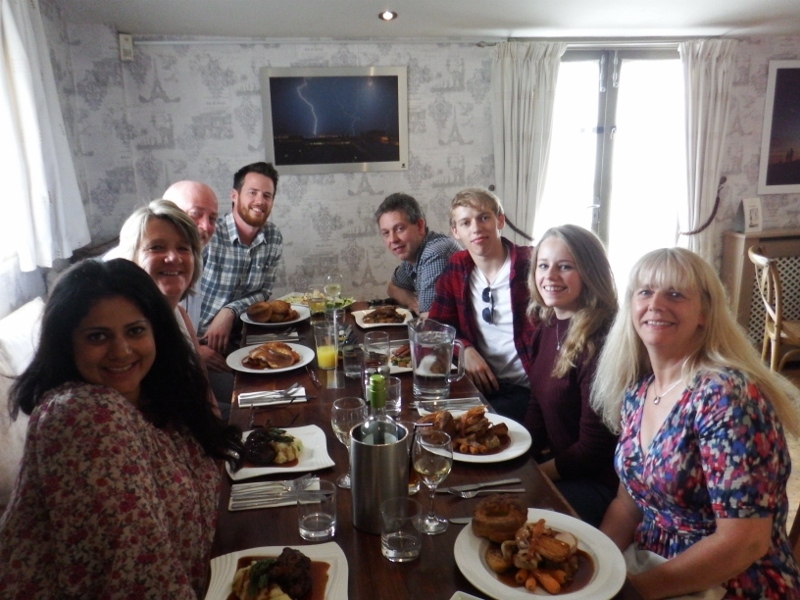 After the stall was packed up we drove to the Kings Arms in Meopham and all enjoyed a delicious Sunday lunch together. In the afternoon back at Thomas and Sonal’s house Jasmine was asked to be one of Sonal’s bridesmaids so the talk turned to weddings. Monday 27th Bill and Thomas headed off to Ikea to get some shelving and other bits for the unit and I did something so normal for everyone but I was thrilled – I walked to Sainsburys! 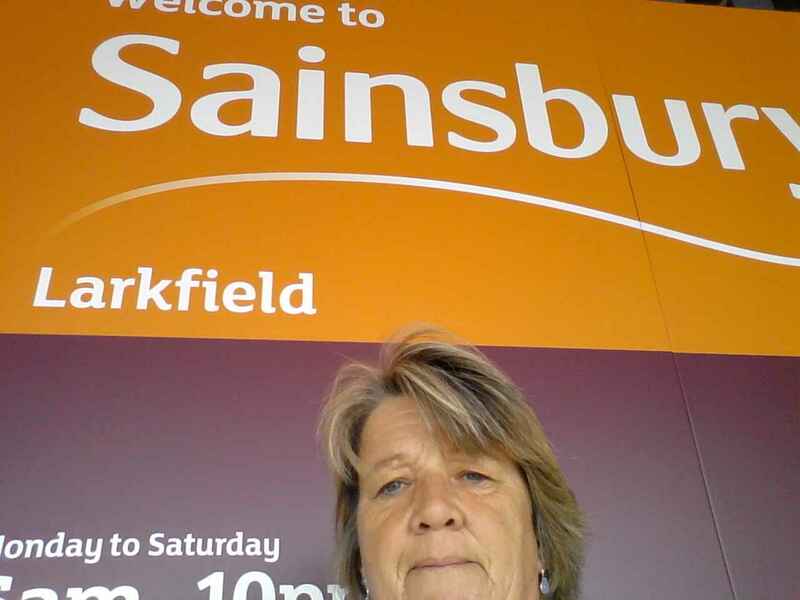 I took this selfie in the entrance and the other shoppers probably thought I was a bit daft but there you go. I had a great time buying all the stuff I can’t normally buy like nice decaff filter coffee, nescafe cappuccino sachets, t bags, stirfry sauces, best jam, oxo cubes, birthday number candles, as well as some strawberries and raspberries to just eat. Tuesday was spent packing as much as possible in just 2 cabin bags for the Easyjet flight to Scotland. To take hold luggage on easyjet was £32 a piece each way! Thomas drove us to Gatwick for the flight to Inverness. Goodness it was cold when we landed. Another layer went on, Bill walked around with 4 layers including his jacket and I’ve had 3 with my coat. James was excited to have us in Scotland. We hadn’t been there for 2 1/2 years. 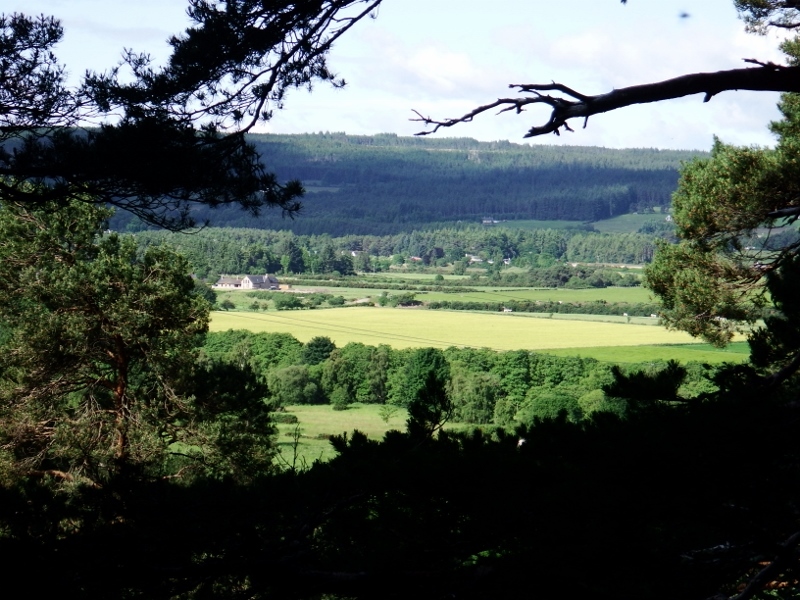 The area around the castle is stunning and it’s only a mile or so from James’s house. 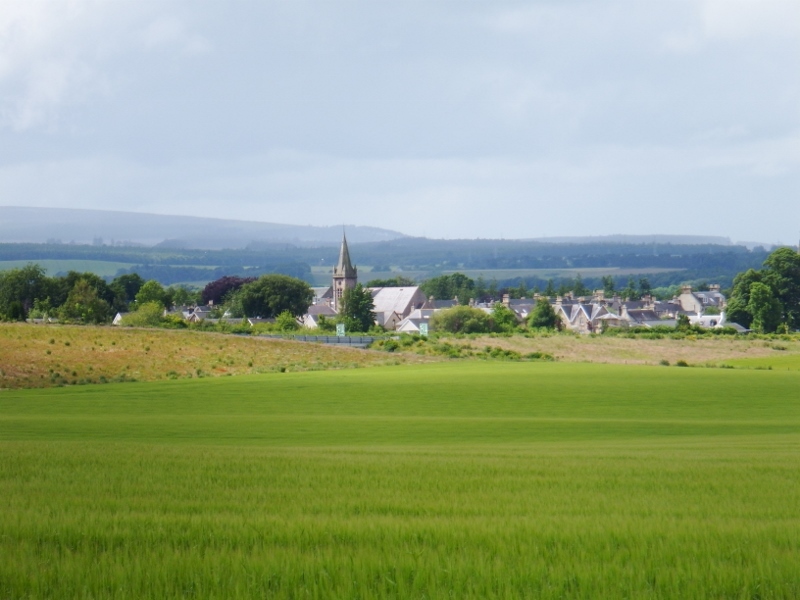 In the afternoon we went into Elgin to get some shopping so I could make some of James’s favourite dinners. That evening I started with a big lasagne and salad. James made the garlic bread. Thursday was big excitement because James was offered a job in Saudi Arabia. A great opportunity, we are very proud of him. So we went out for another walk to celebrate! 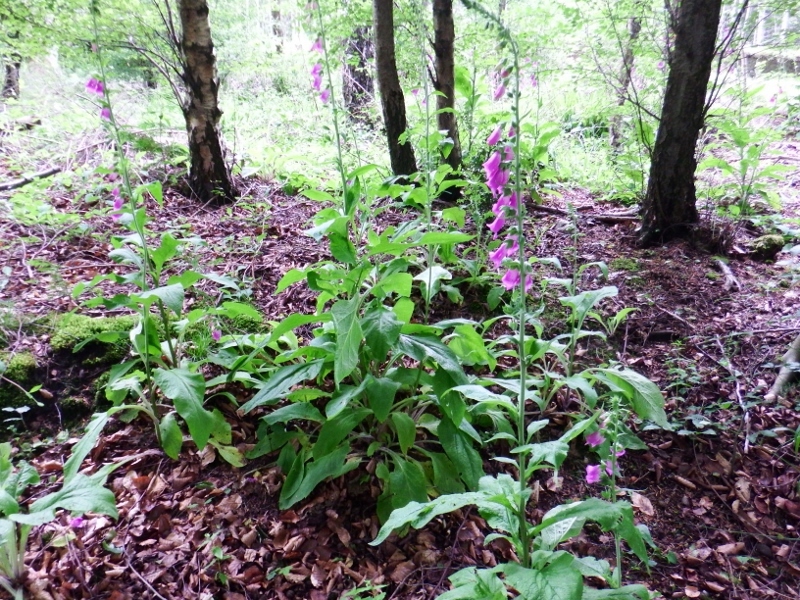 I love the wildflowers in Scotland, these foxgloves were every where, so rare in England. 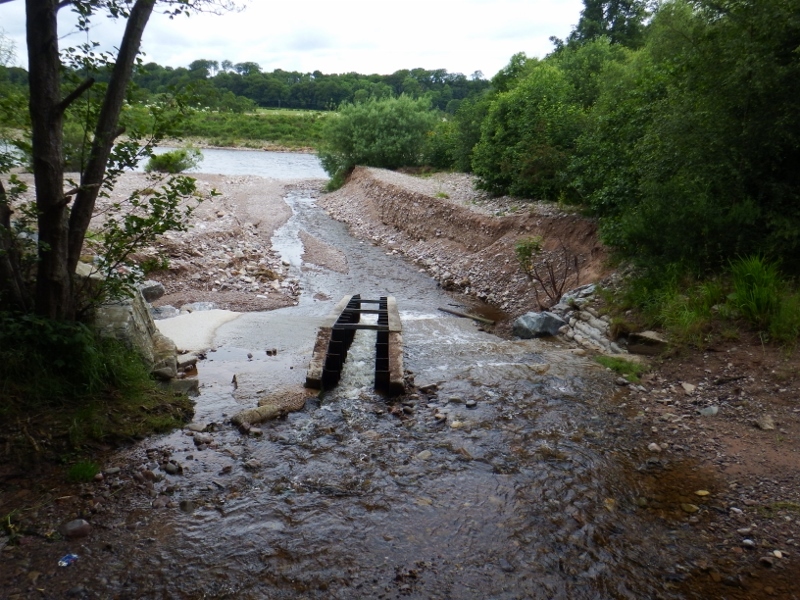 We crossed a burn (a tributary of the river Spey) by the ford which also had a salmon staircase leading up the river. Unfortunately it isn’t salmon season so there wasn’t any to catch. 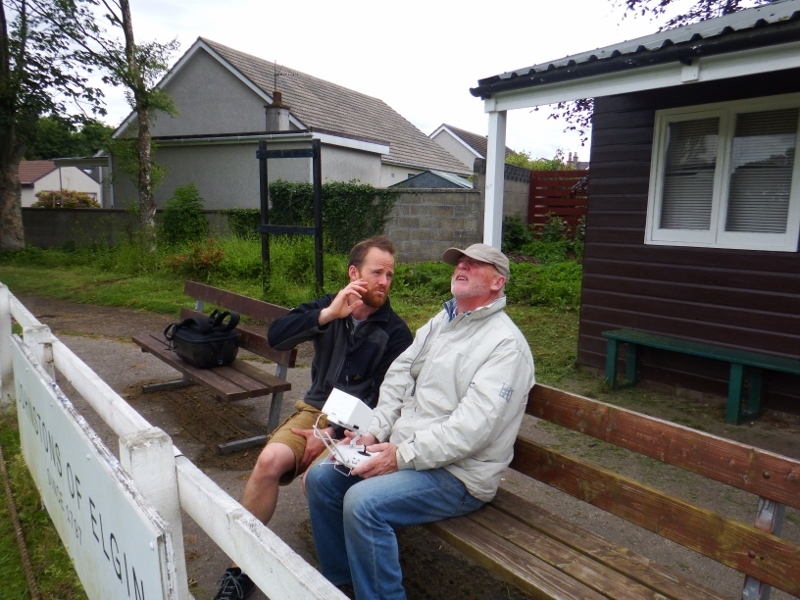 Our destination was the cricket field so James and Bill could fly James’s drone, otherwise known as his pet! 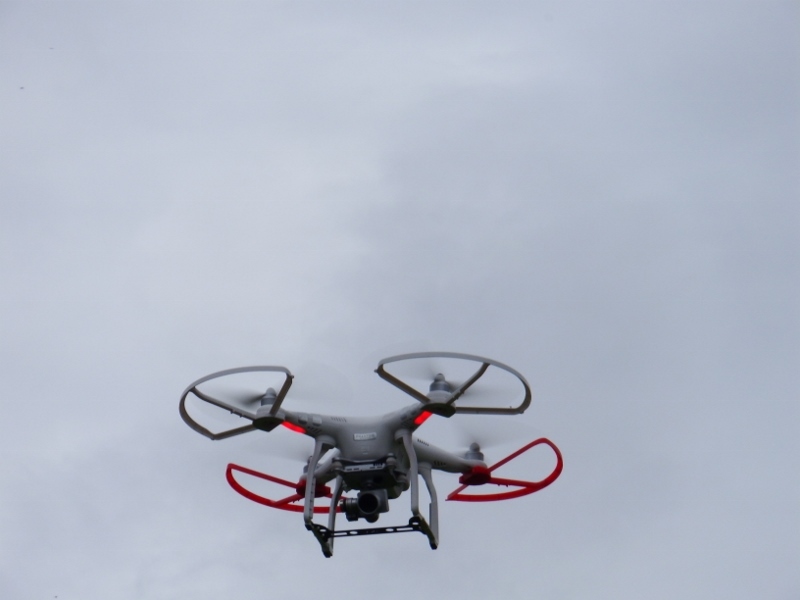 Bill was given very strict instructions on how to fly it after James had launched it but he wasn’t allowed to land it. Now Bill wants one. 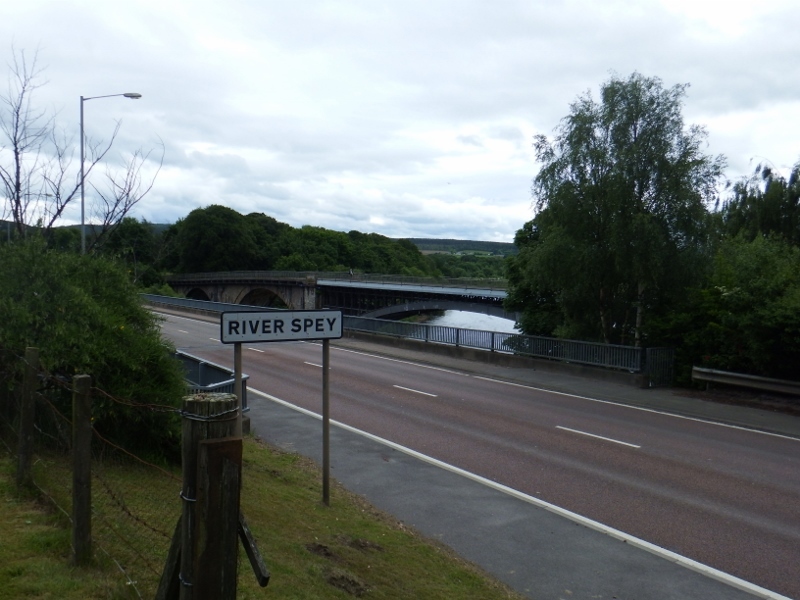 We continued our walk towards the Baxters coffee shop crossing the river Spey. 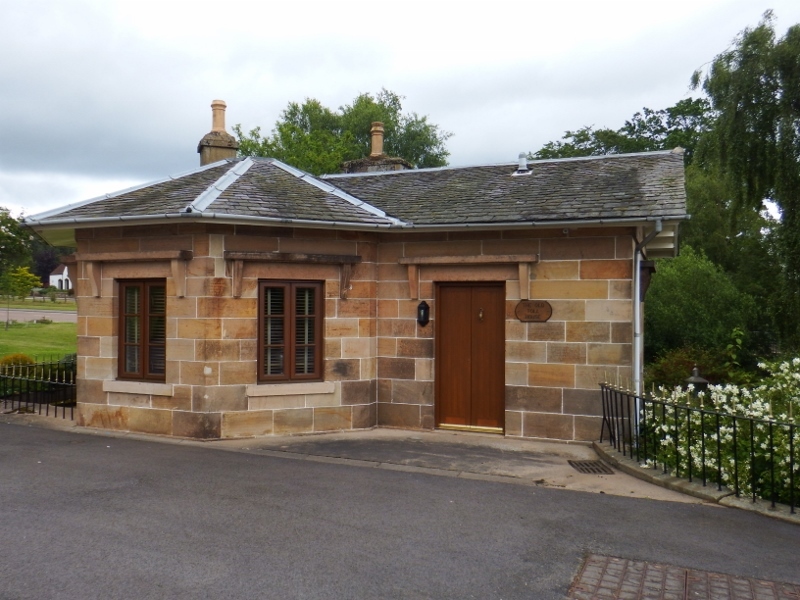 This little cottage was once the tollgate for the old bridge, which is now a footpath and the new bridge lies alongside it and Baxters is the other side. Perfect. 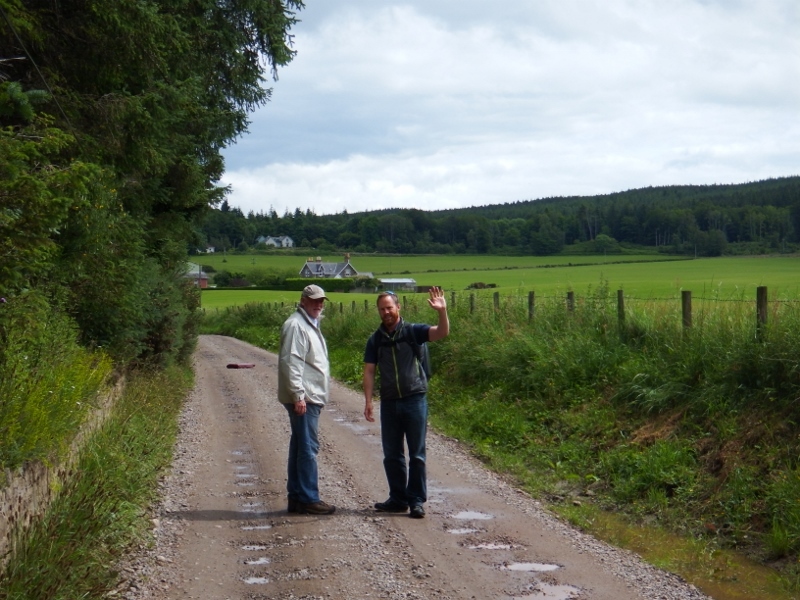 On Friday Bill and James were waiting for some parts to be delivered so James drove us all a bit further out to see more of the surrounding countryside. We were lucky with the weather. It was normally sunny in the mornings for our walk or drive then clouded over later with the odd shower. What we really enjoyed was the light evenings. It didn’t get dark until 10.30 or even 11.00pm in Scotland. 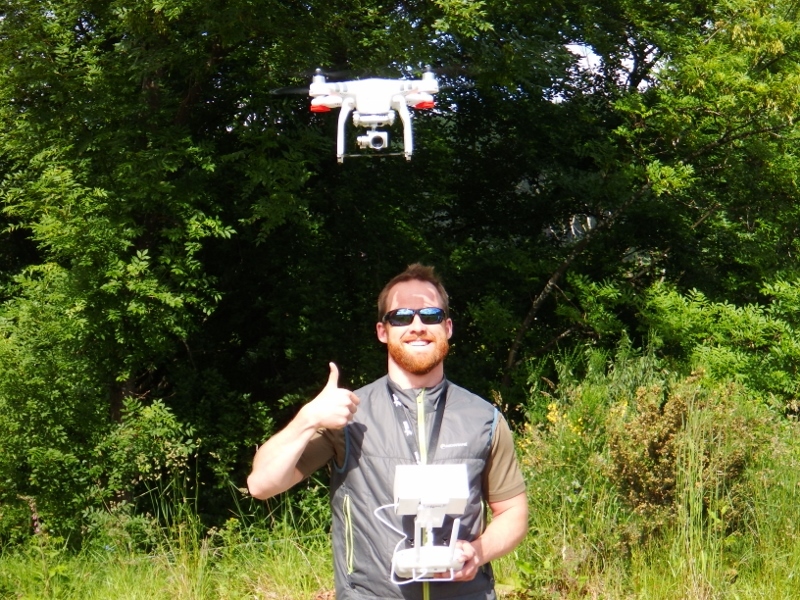 and James took his drone. 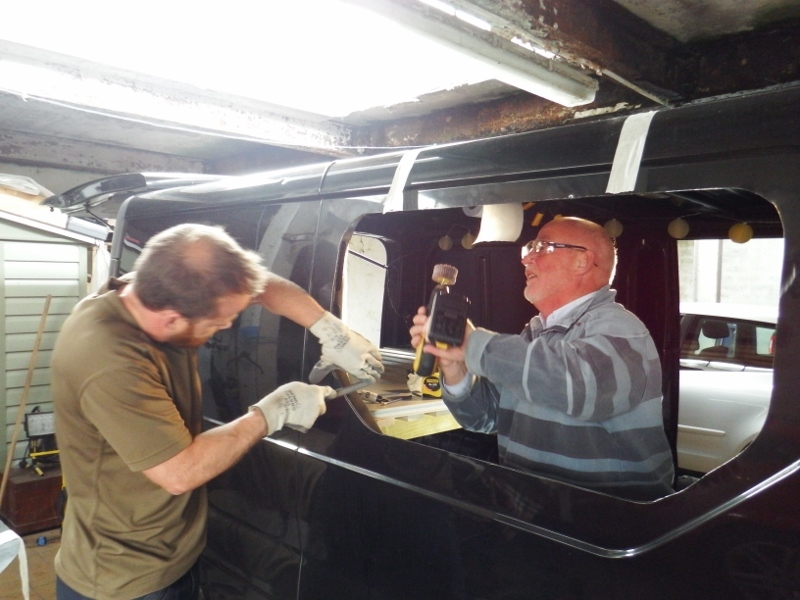 In the afternoon the rubber seal arrived they had been waiting for and the installation of the van windows began. Bill started with the new reciprocating saw they had bought. 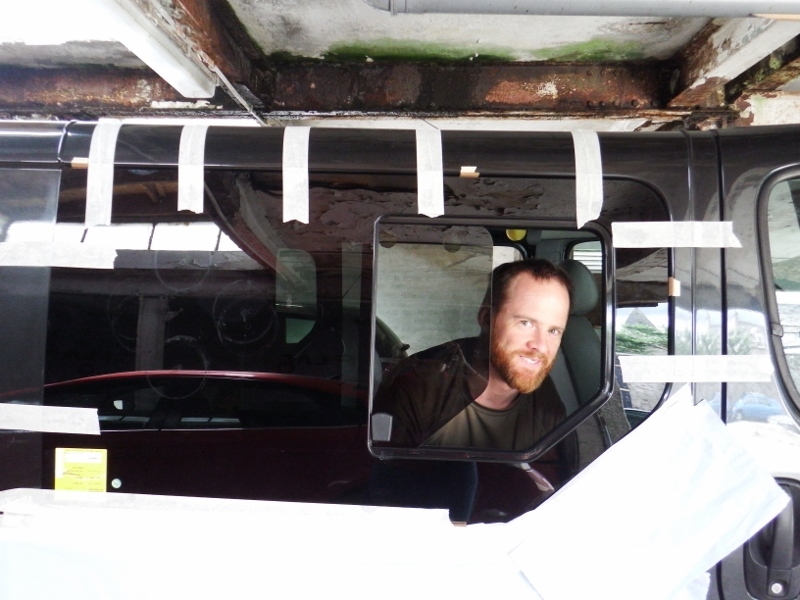 I could hear the noise from inside the house as Bill made a huge hole in the side of the van. James did the fileing and clipped on the rubber seal. With Bill giving him the confidence he cut the other side himself. It was quite brave of both of them cutting 2 big holes in the side of the van. Once the rubber edging was clipped in place on both sides it was left for the day. I had my hair cut and Hailey arrived in the evening. In the morning Hailey and I went to the garden centre for coffee while Bill and James put the windows in. It was a two man job with one on the inside and one on the outside. They looked really good when they were finished but I forgot to take a final photo. 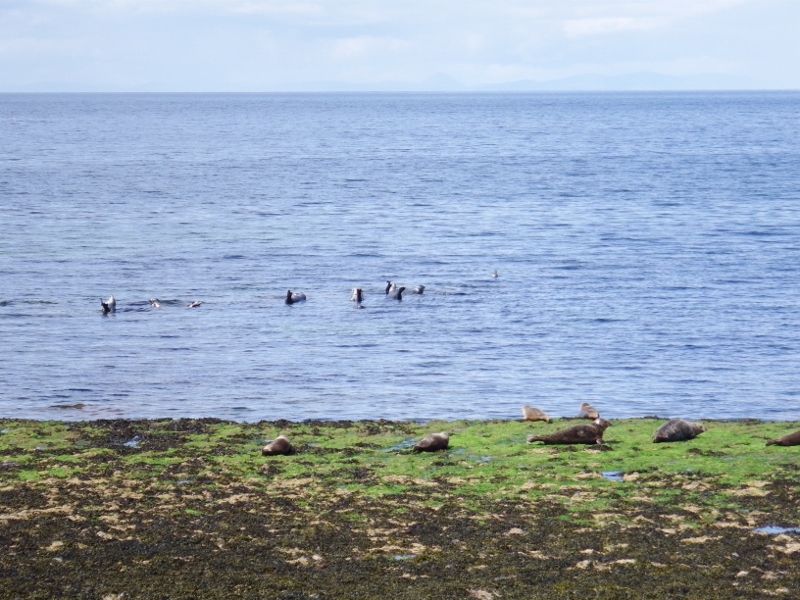 In the afternoon we all went for a drive and saw these seals playing on the beach. 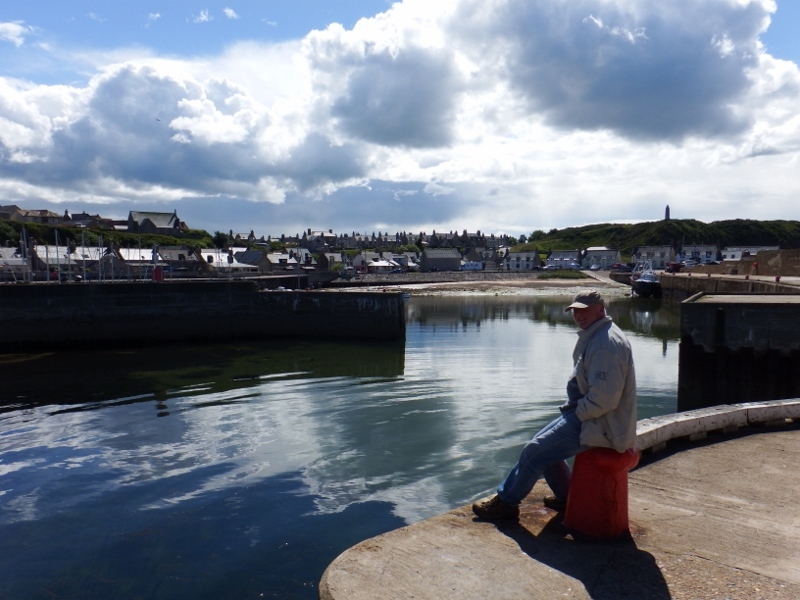 We continued onto Findochty to see the little harbour there. When we get back to the UK hopefully we’ll sail up to Scotland so it was good to look around first. The sea was really calm on that day. I wonder how often it’s like that. It was beautiful scenery. Bill looking across the inside of the harbour. Further along the road we stopped at Cullen which had another small harbour but we wouldn’t have been able to get Camomile in there. The town was overlooked by this beautiful old railway viaduct. All the little towns were very pretty. 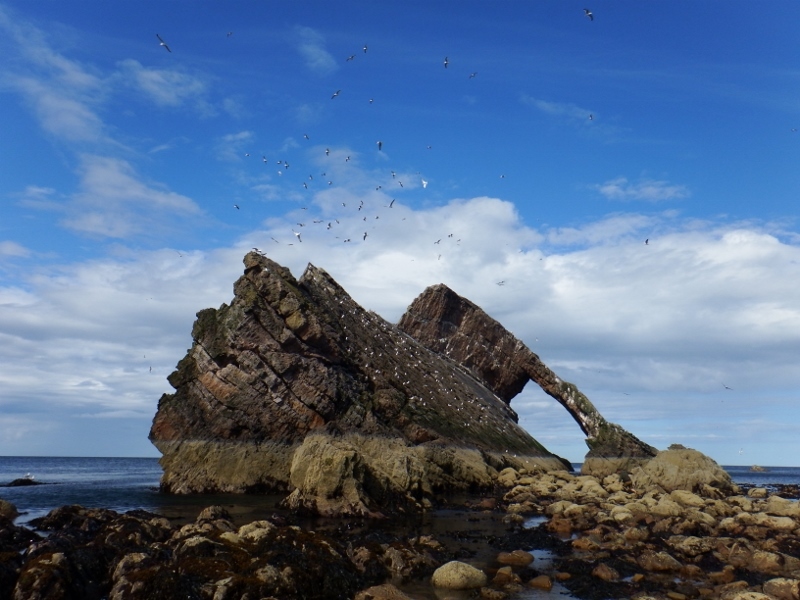 The last place we stopped was Bow Fiddle rock. An amazing piece of sedimentary rock that had had a hole worn through it over millions of years. A very beautiful rock. We climbed down to get a closer look. It was covered in seabirds. On the sunday we enjoyed another drive across to Lossiemouth that had a small marina that would be good for us but I left my camera behind. 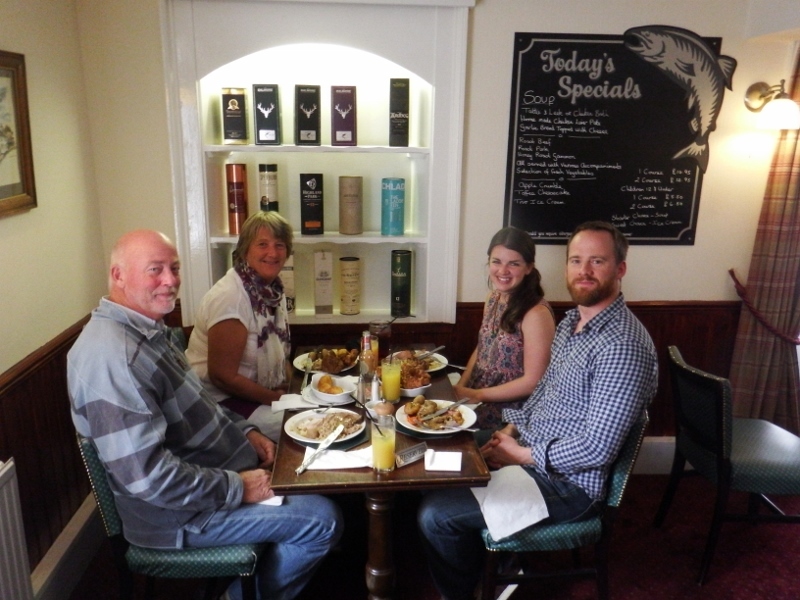 For Sunday lunch we went to the Gordon Arms hotel for their delicious carvery. James, Hailey, Bill and Nichola her mum. 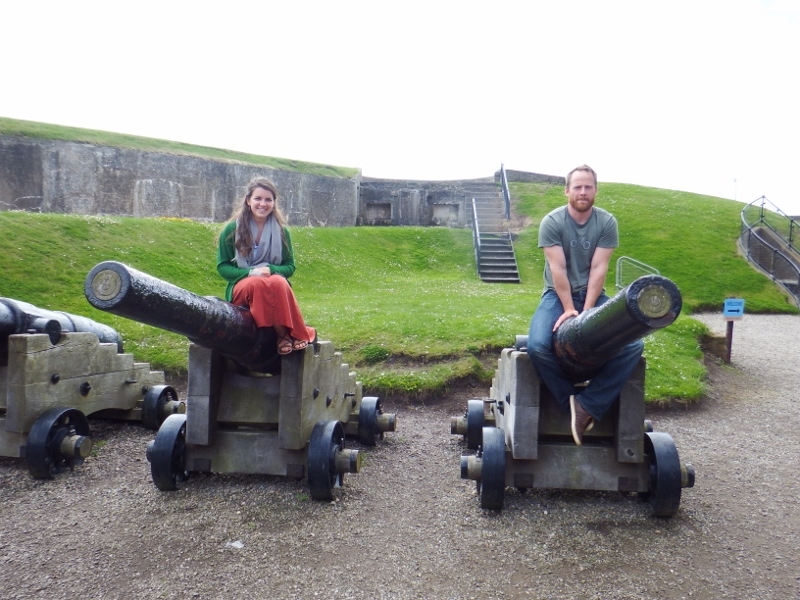 Monday 4th July we packed our bags and left James’s house but the four of us continued together and drove for about 3 hours south to Broughty ferry near Dundee where Hailey lives. 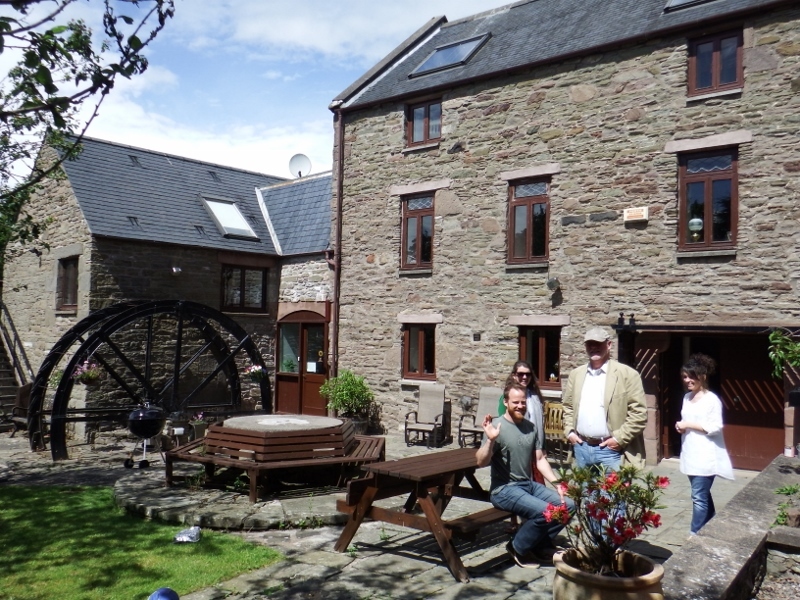 Hailey’s parents own a beautifully restored old mill. We were made very welcome and enjoyed a lovely dinner with all the family. It felt warmer now we were further south. 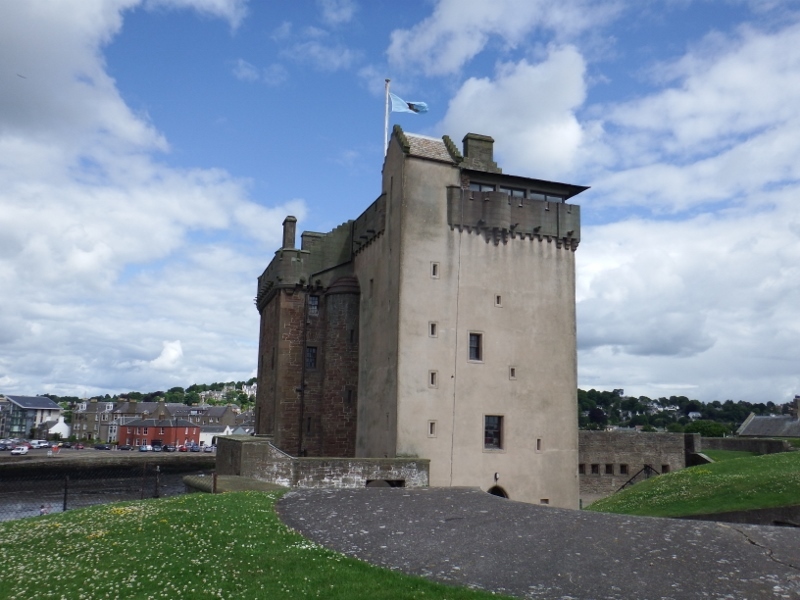 On Tuesday we went to explore the beautiful Broughty ferry castle built on the northern shore of the River Tay. 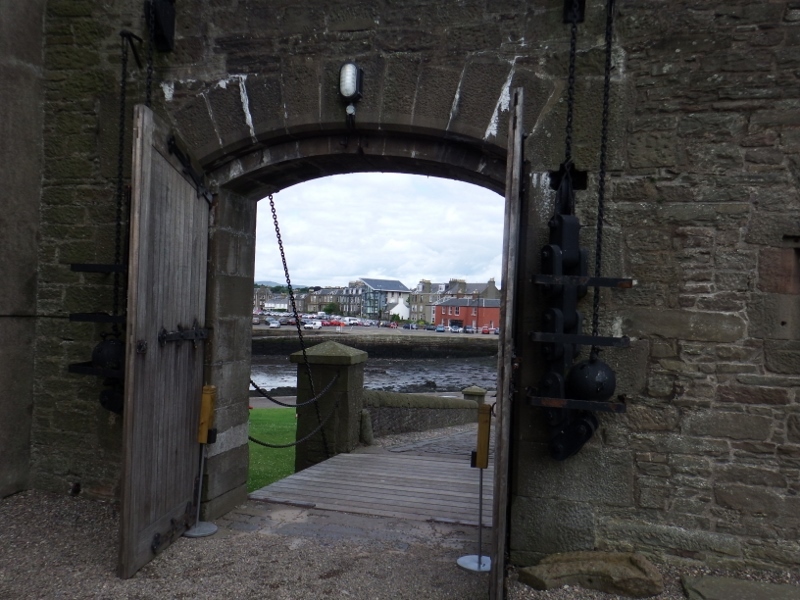 This 15th century coastal fort has faced many battles and sieges, and was rebuilt in the 19th century as part of the River Tay’s coastal defence system. 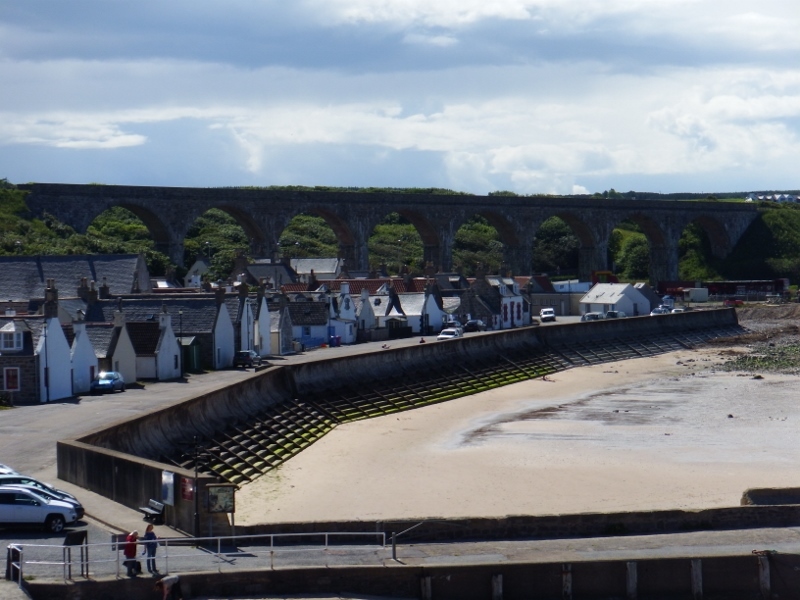 It now houses a fascinating museum featuring displays on the life and times of Broughty Ferry, its people, the environment and the wildlife that lives close by. 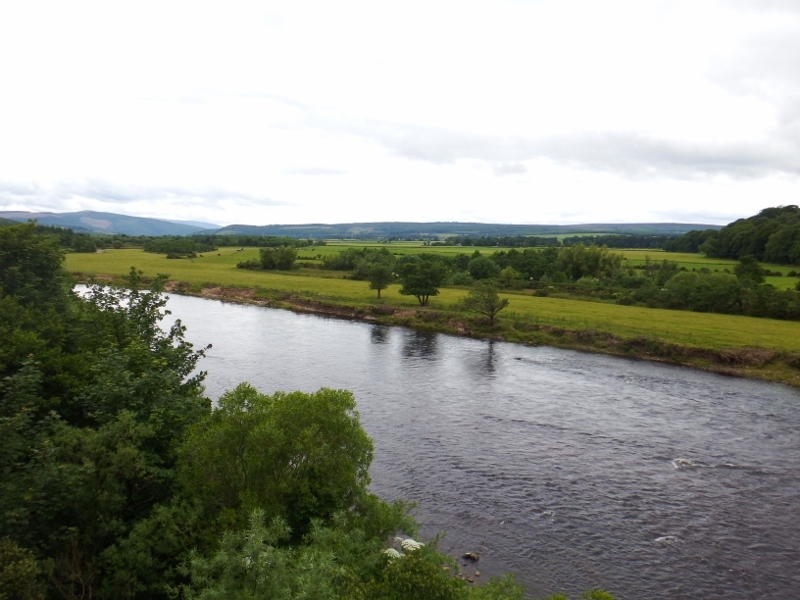 It gave us wonderful views up and down the river Tay. 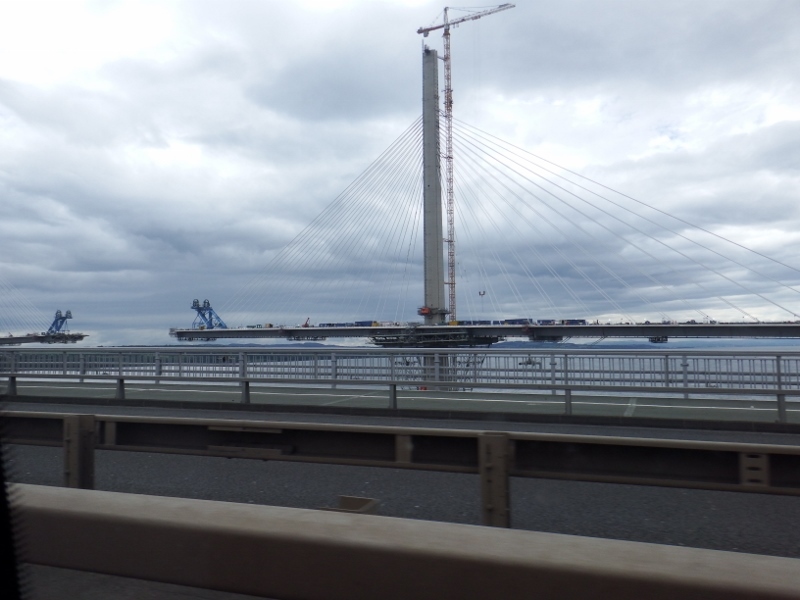 In the afternoon we continued further south to Edinburgh passing the new bridge being built over the Forth river. Wednesday 6th was Bill’s birthday. We had stayed the night in an AirB&B (we stayed in someone’s apartment) and James and Hailey had cooked Bill a wonderful steak dinner. In the morning we all had eggy bread and bacon before exploring the city. Edinburgh is a beautiful city. In the centre all the old buildings have been wonderfully preserved. 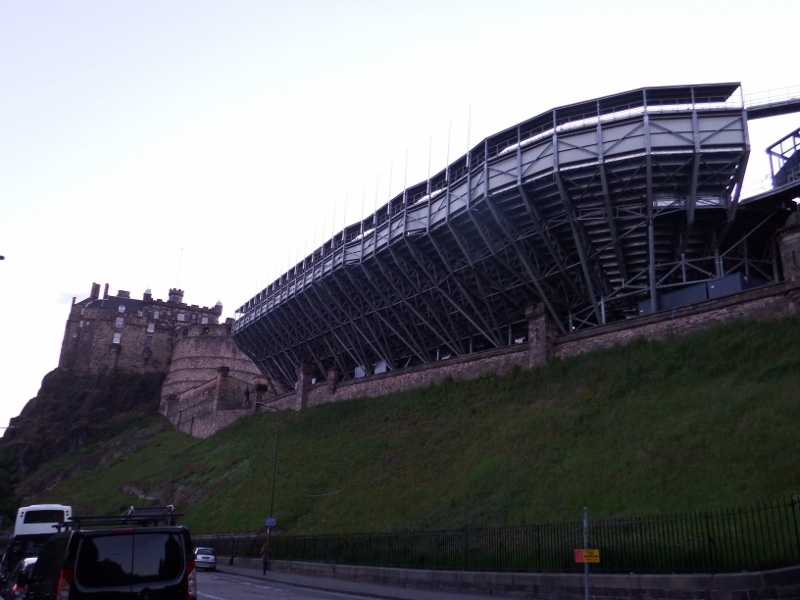 This amazing structure has been erected up over the outer walls of Edinburgh castle for the military tattoo that would be taking place the following week. Once the festivities are over the whole thing is taken back down again. 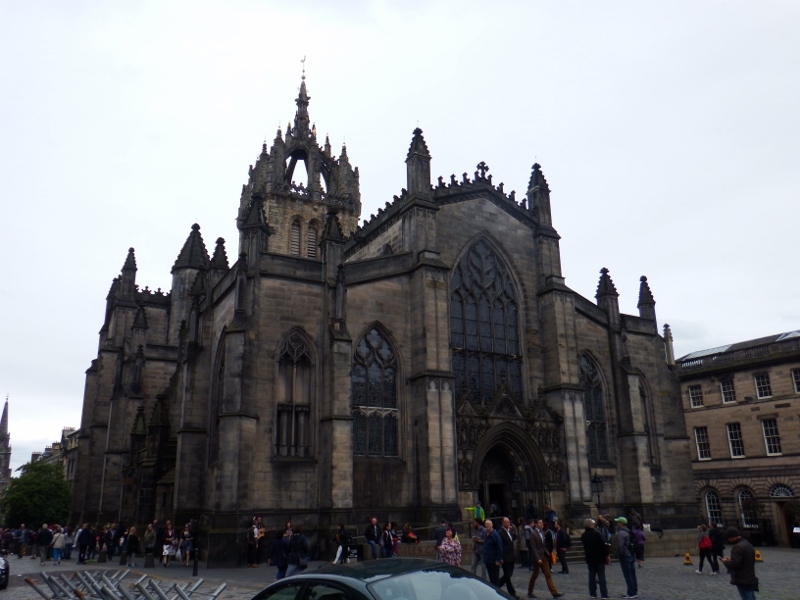 We’ve been into the castle before so this time we went into St Giles cathedral. 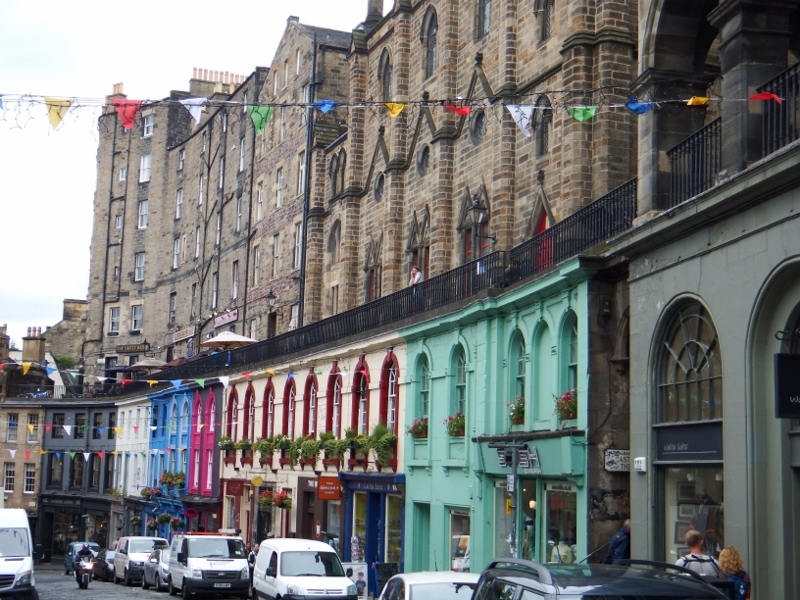 There’s so much history in Edinburgh, it’s a wonderful place. We walked down the hill into the shopping area to look around the shops. 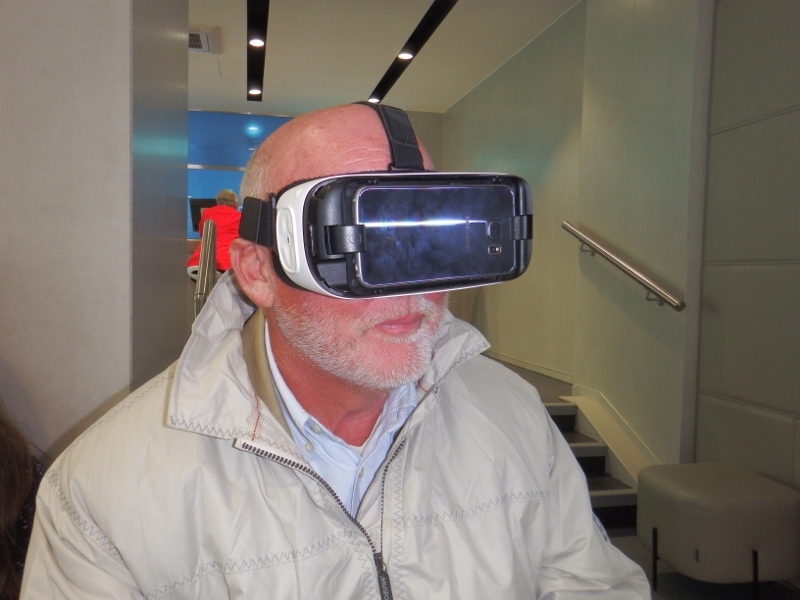 James decided Bill needed to try a virtual reality headset. To demonstrate it’s use it was showing some off piste skiing and a roller coaster. All too soon it was time to drive to Edinburgh airport and say goodbye to James and Hailey. We had enjoyed our holiday within our holiday. We arrived at Gatwick and Thomas picked us up. Most of Bill’s birthday was gone but the next day Thomas cooked him a delicious egg and bacon birthday breakfast. I spent the day packing our bags which wasn’t easy with all the bits we had bought for the boat and ourselves but eventually it all fitted. Bill spent one last day with Thomas in the unit. Thomas cooked our final meal which was a delicious roast pork dinner with crackling that melted in your mouth and scrummy roast potatoes. Sonal’s mum Meena joined us and we gave her a beautiful orchid for letting us stay with her (she lives 6 doors away from Thomas). On Friday morning with a heavy heart it was time to say goodbye to Sonal, Meena and little Slinky. Thomas drove us to Heathrow after cooking us another wonderful breakfast. We had so enjoyed the quality time we had spent with both the boys and Sonal and Hailey. Thank you to everyone who we stayed with and apologies for those we didn’t get to see this time. 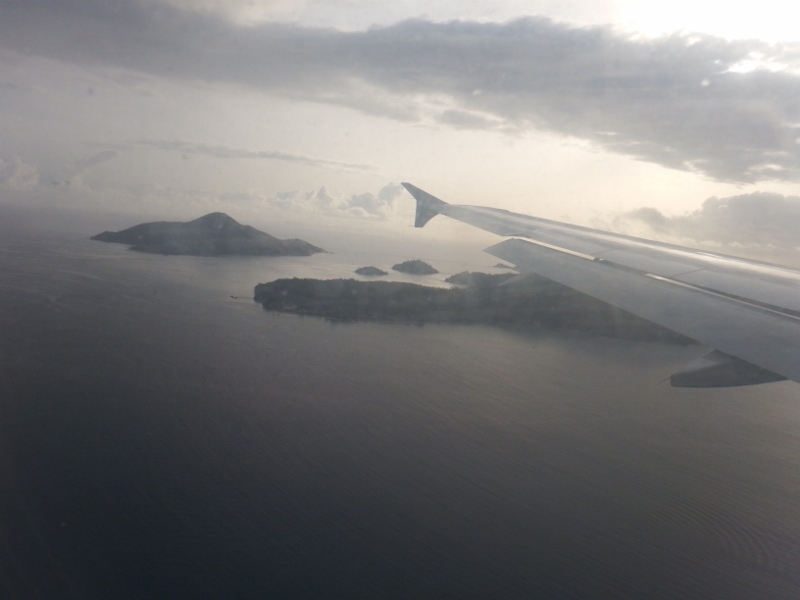 As we came into land at Mahe in the Seychelles I could see the islands from the window.